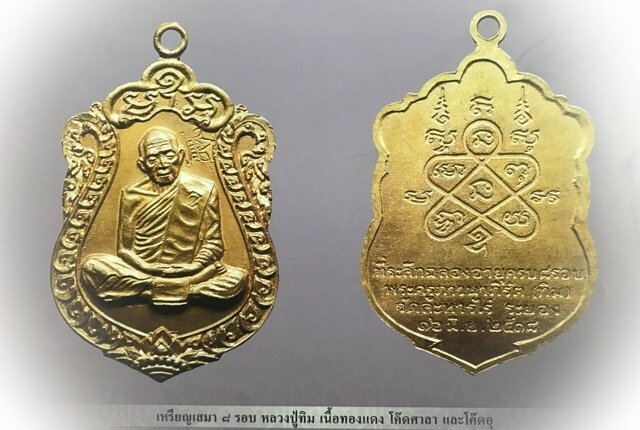 Presenting a certificated authentic third prize winning exhibit of the all time eternal Masterclass Pra Niyom Amulet so highly held in esteem by devotees of Luang Phu Tim Issarigo, of Wat Laharn Rai; Namely the Rian Sema Paed Rorb, in Nuea Tong Daeng, with Code Stamp Khom Agkhara "U" Gammagarn Model exquisitely fashioned custom made Solid Gold Waterproof Casing included from the 2518 80th Jubilee 96th Birthday Edition blessed and released by Luang Phu Tim at Wat Laharn Rai..
A truly High Status Amulet with Undisputed Power. 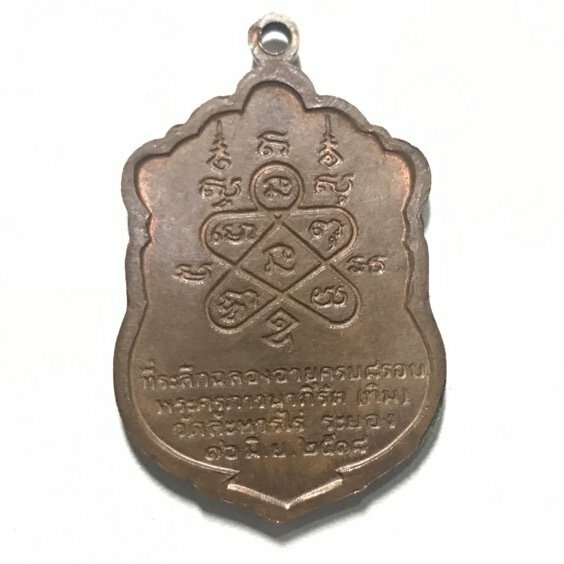 The Rian Sema is one of the most highly preferred amulets of Luang Phu Tim, and carries master Class Status in the Amulet World, for its undisputed powers of the Sacred Blessings of Luang Phu Tim, and for its great rarity and beauty. 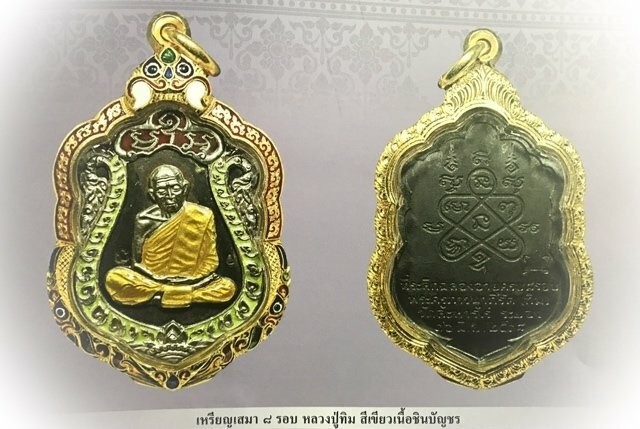 Below; Special Gammagarn Rian Sema Paed Rorb Nuea Ngern Long Ya Rachawadee Sam See (Trairongk) Solid Silver with Tricolored Rachawadee Enamels. 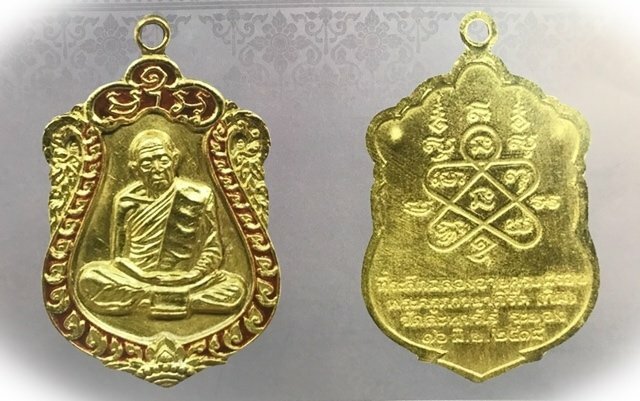 The amulet comes with Free Gold Casing, Free EMS Shipping included, & with A4 plastified photograph certificate of authenticity, which holds the status of third prize winner, in the 4th of March 2018 Amulet Competition of the Luead Ban Kaay LP Tim amulet association of Ban Kaay in Rayong, with signature of its president Ajarn Dr. Pisek. 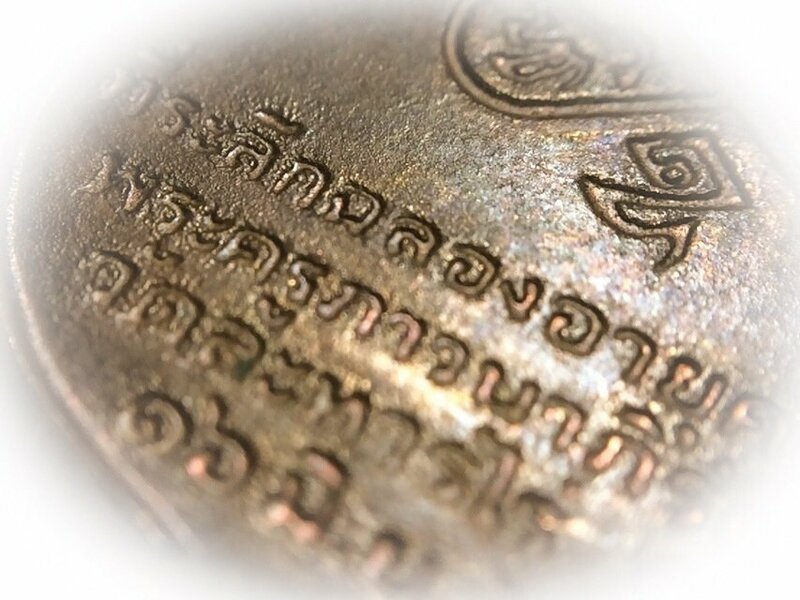 The Code stamp Khom Agkhara "U" is embossed on the chest area Sangkati Sash of Luang Phu's robes on the front face, with the Thai letter T (ท for Tim) codestamp on the bottom of the Sangkati Sash. 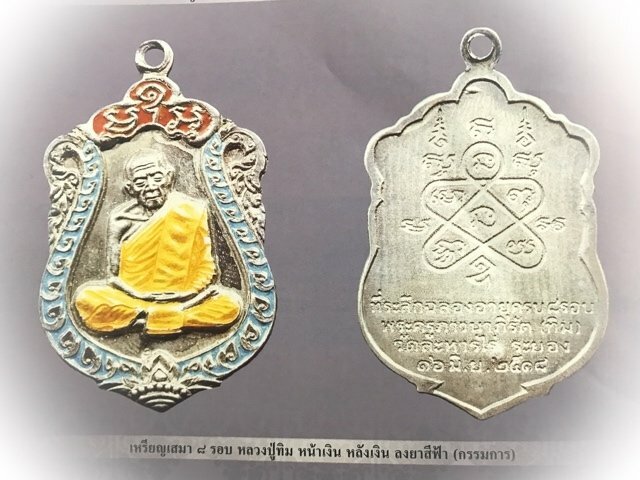 The Rian Sema Paed Rorb is one of the all time accepted Pra Niyom Master Class Category amulets of the original official Pantheon (which is now more expansive than it was a decade ago). 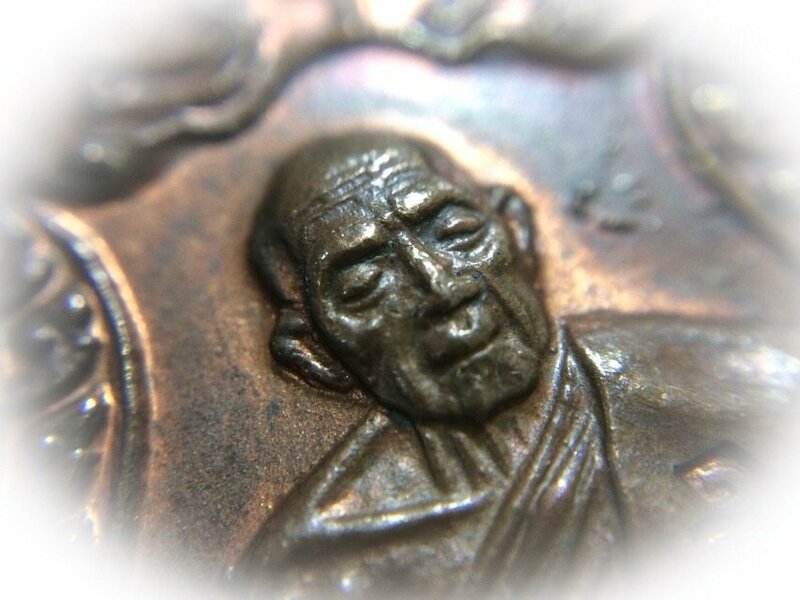 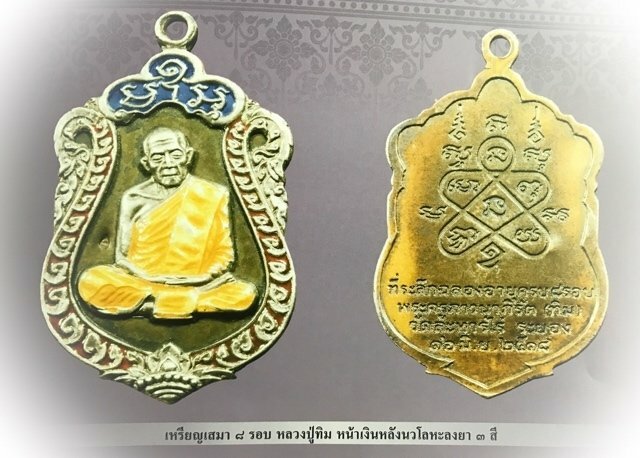 The Rian Sema Paed Rorb and other coins were made on various models, to celebrate Luang Phu Tim's 96th Birthday and 80th Year of Ordination (Paed Rorb means 'eight revolutions', meaning eight jubilee decades), with the devotees and the temple comittee organising the creation of two editions, the 'Chalong Hor Chan' edition celebrating the completion of the new refectory in the temple, and the Chalong Ayu Krob Paed Rorb 80th Jubilee edition. 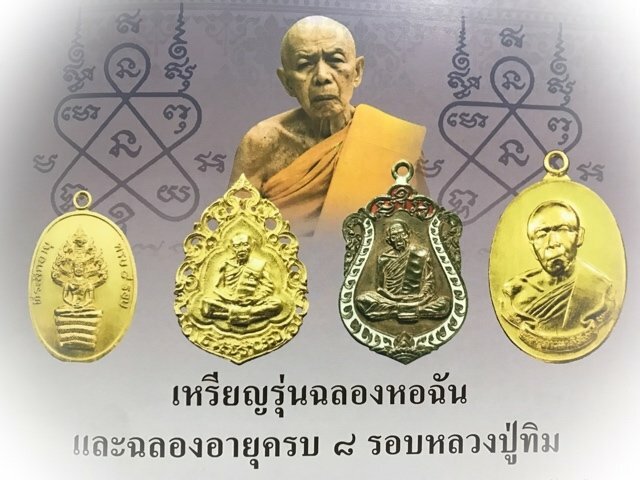 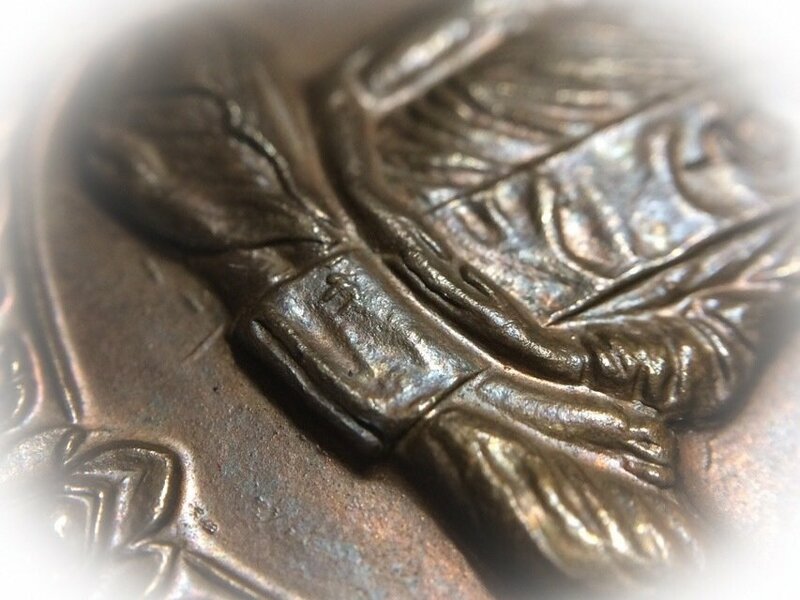 The whole series of coins released on the 16th June 2518 BE, which was his final Edition that was made and blessed directly at Wat Laharn Rai before Luang Phu's Passing on 16th October 2518 BE. 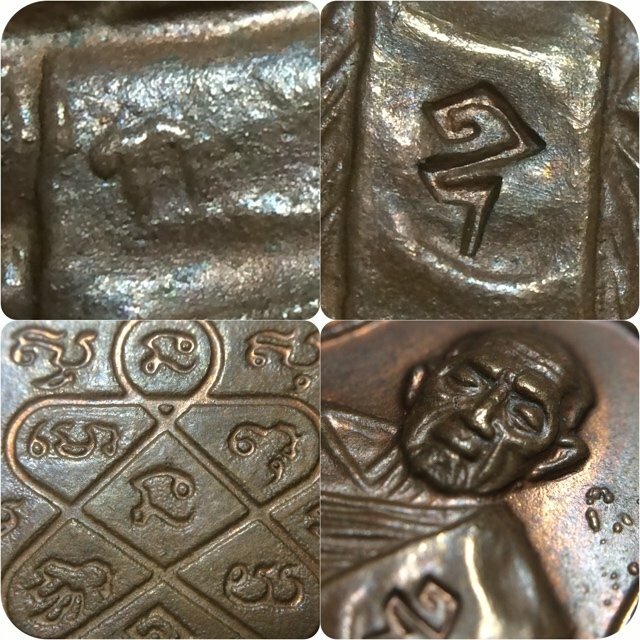 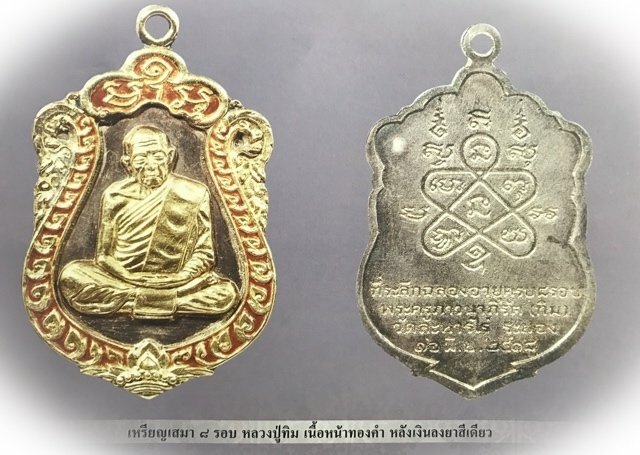 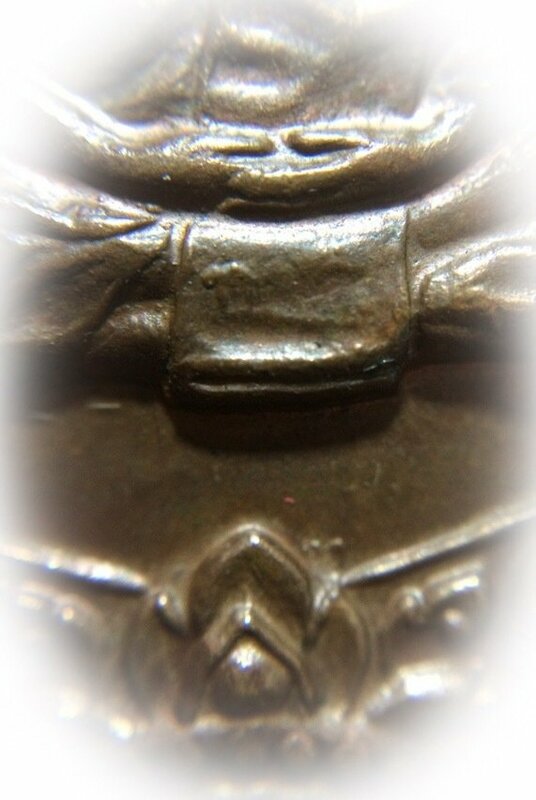 Both the Chalong Hor Chan coins and the Chalong Paed Rorb coin editions became unified to be known under the same edition name, as the 'Paed Rorb' edition,, and included the Rian Pra Nakprok Paed Rorb Buddha with 7 headed naga Canopy oval coins, the Rian Huang Chueam Paed Rorb soldered pendant ring coin, the Rian Lor Chalu Paed Rorb lotus petal cutout coin, and last but not least, the Rian Sema Paed Rorb. 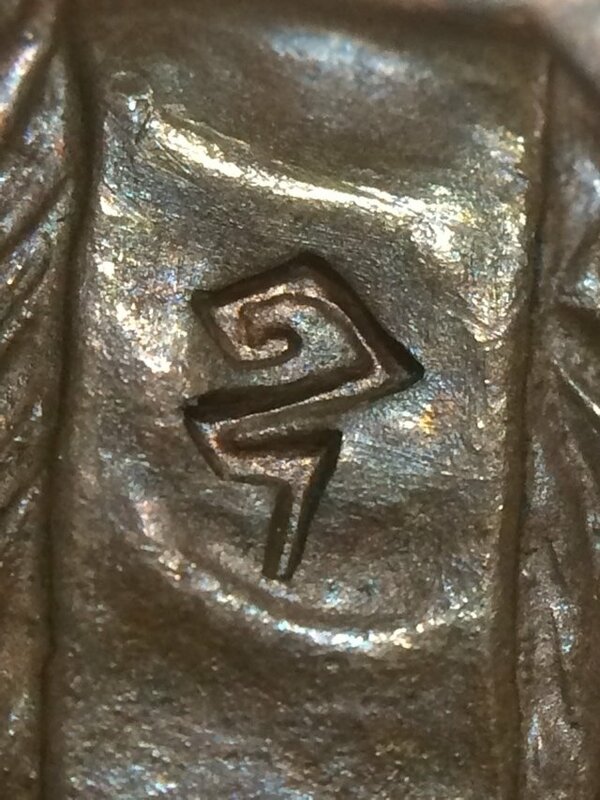 The Rian Sema Paed Rorb was made in 8 officially documented versions; 1. 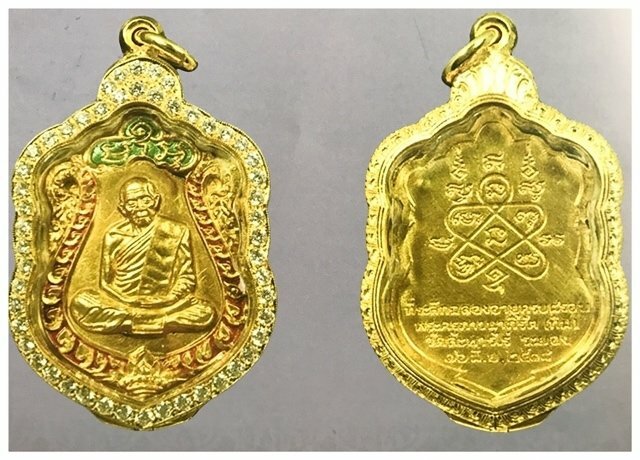 Nuea Tong Kam (Solid Gold) - 56 amulets made (although some accounts say 79 were made), 2.Hnaa Tong Kam Hlang Ngern Long Ya (Solid Gold Image with Solid Silver Back Face and Ya Rachawadee Colored Enamel embellishments) - 169 Amulets made, 3. 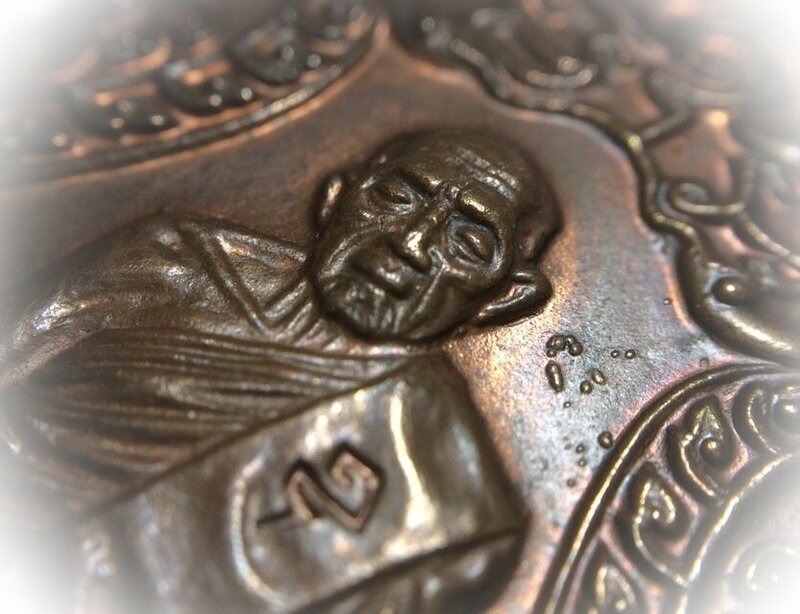 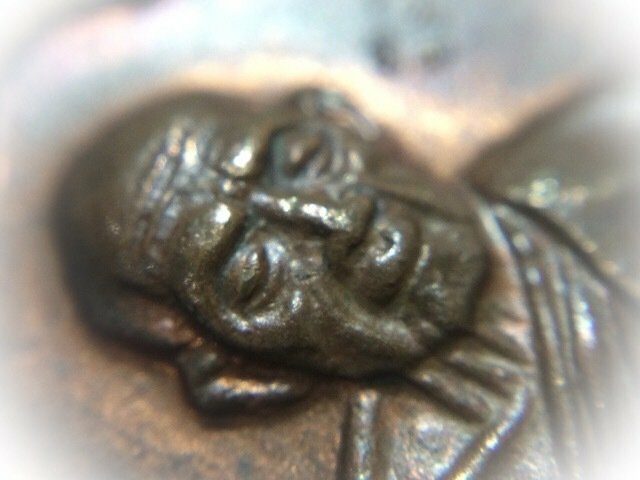 Hnaa Ngern Hlang Ngern Long Ya Sam See (Solid Silver image and coin face with Ya Rachawadee Tri-Colored Enamel embellishments) - 897 Amulets made, 4. 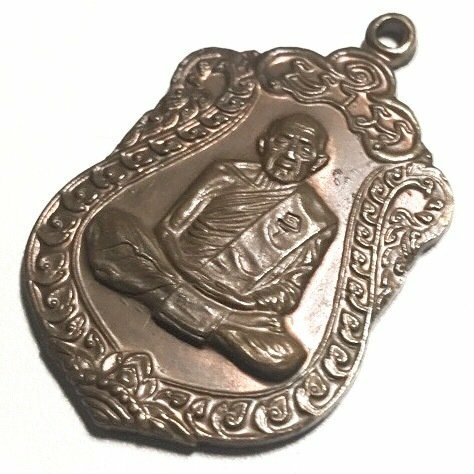 Hnaa NgernHlang Nava Loha Long Ya (Solid Silver Front Face with Nine Sacred Metals Alloy rear face, and Ya Rachawadee colored enamel glaze) - 2297 Amulets made, 5. 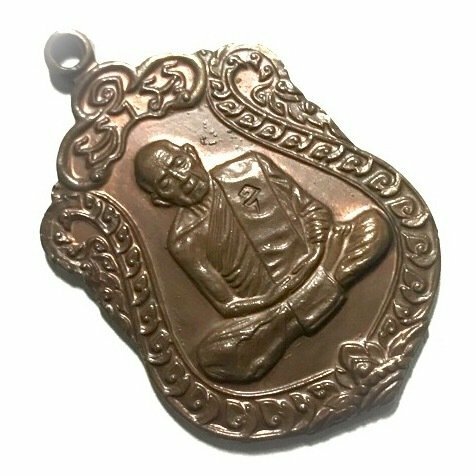 Nuea Ngern Long Ya See Khiaw (Solid Silver with Green Rachawadee Volored Enamel Glaze) - 1897 Amulets made, 6. 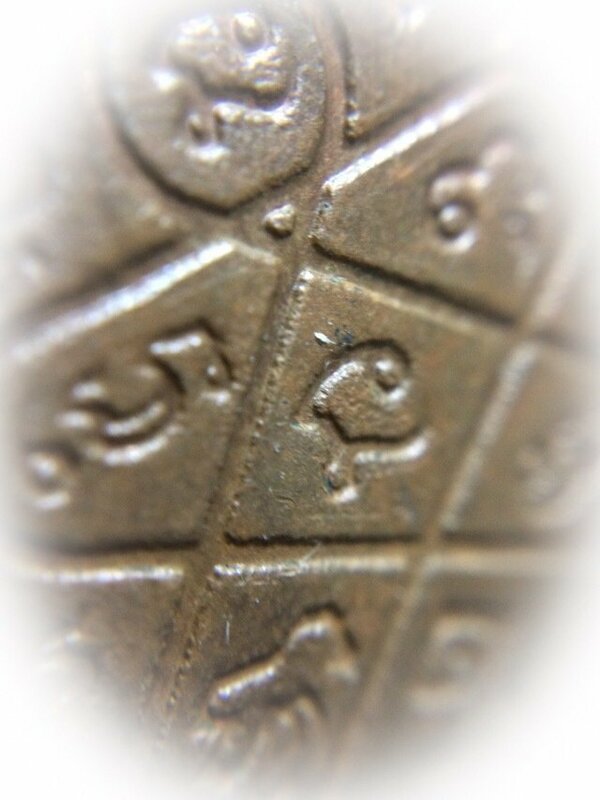 Nuea Tong Daeng Long Ya (Sacred Copper Alloy with Ya Rachawadee colored Enamels Glaze) - 50 Amulets made, 7. 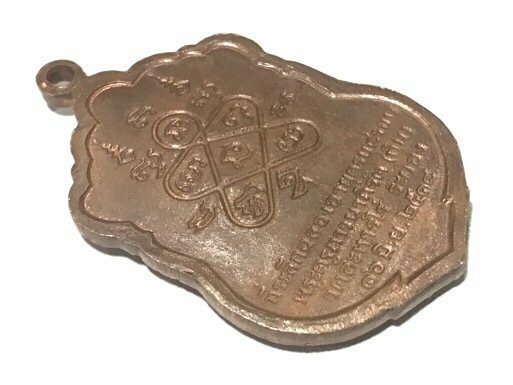 Nuea Nava Loha (Nine Sacred Alchemical Metals Alloy) - 400 Amulets made, 8. 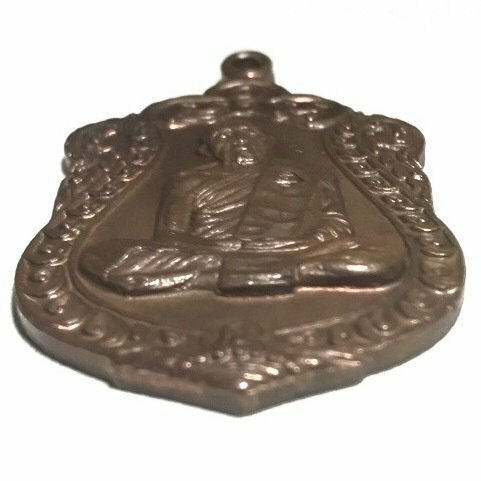 Nuea Tond Daeng (Sacred Copper Alloy) - 22,297 Amulets made. 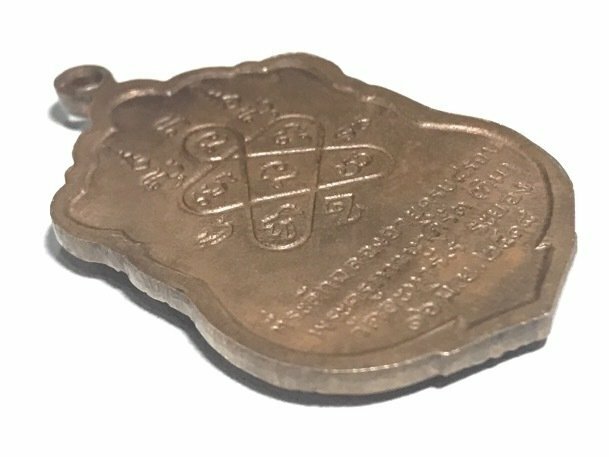 Some of the coins which were handed out in the ceremony were given special code stamps, such as the Code U on the Rian Sema Paed Rorb. 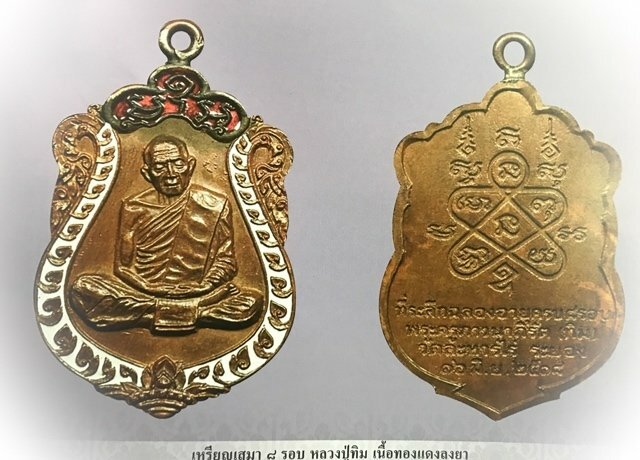 All models are extremely rare including the Nuea Tong Daeng (Especially Code U version), due to the sheer numbers of high end collectors of LP Tim amulets having long since depleted the majority of these amulets from the marketplace for their own wearing, Bucha, and to keep in their showcases. 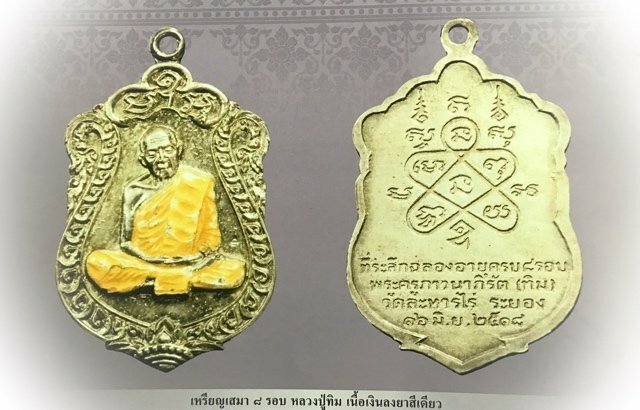 There were also various Gammagarn versions not listed which were made, with differing points of referrence, such as Code U, Code Met Nga (sesame seed shape), Code Na, and Code Sala, stamps, and different variations of Rachawadee Enamels. 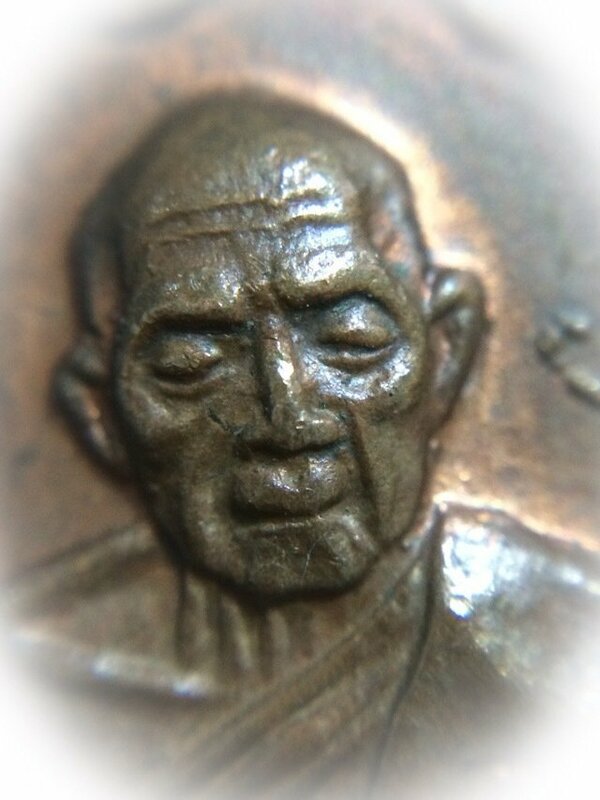 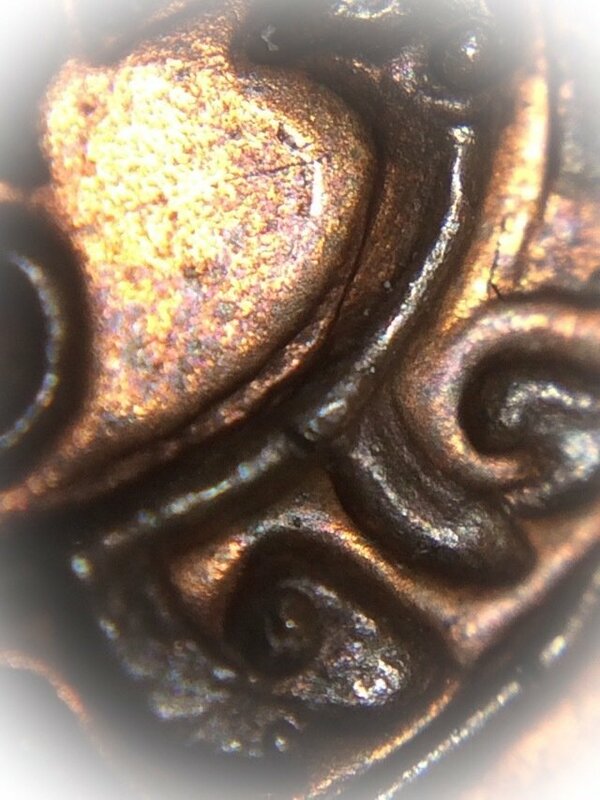 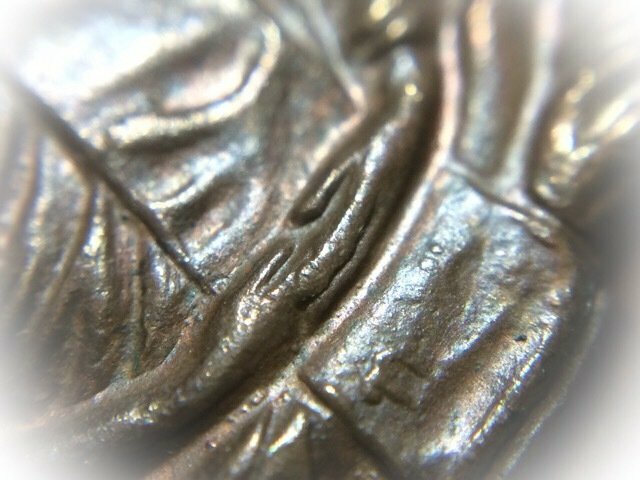 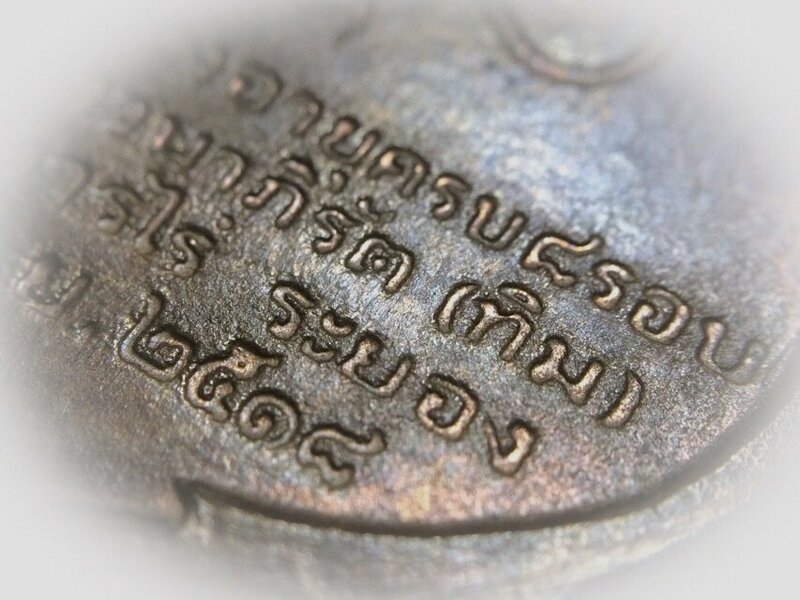 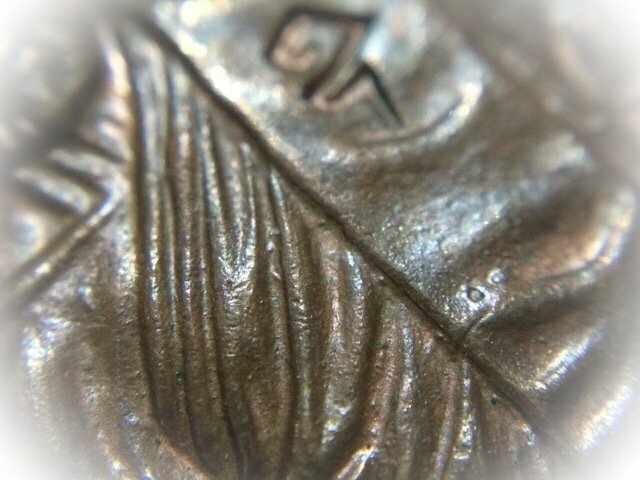 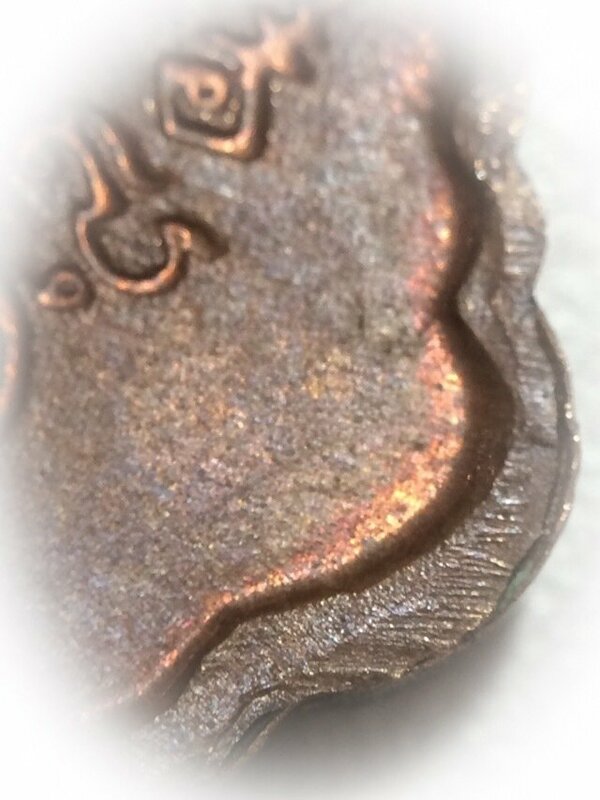 Some coins also have hand made inscriptions on them from Luang Phu Tim. 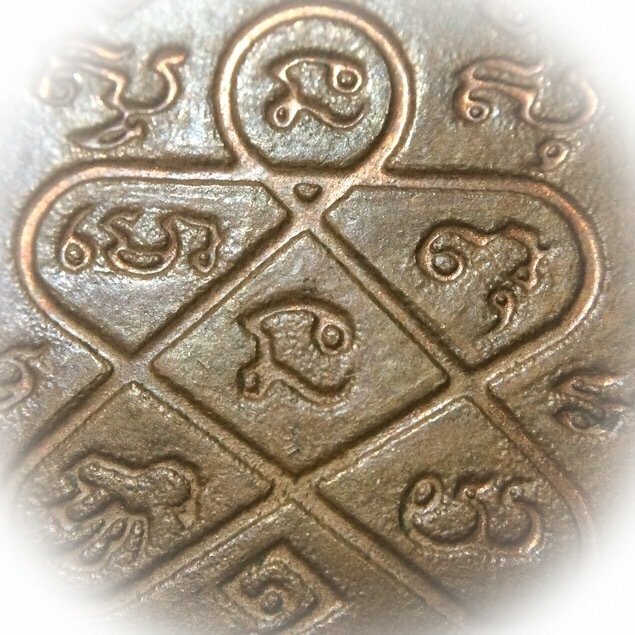 The rear face has the sacred Yant Grabong Khwai (also known as 'Yant Ha' or 'Yant Grabork Khwai' or 'Yant Ongk Pra') embosssed on the rear face. 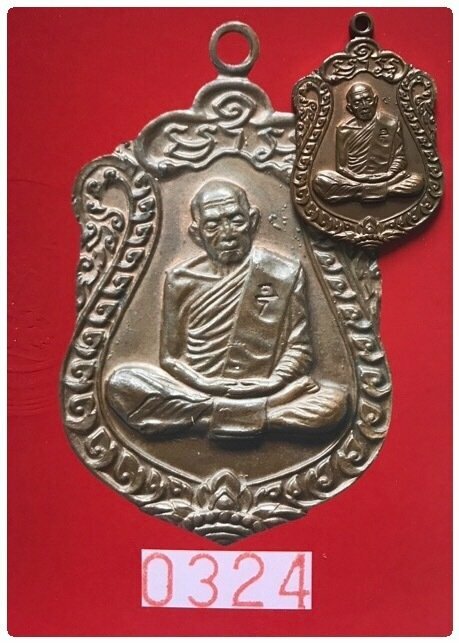 below the Yantra are words recounting thenpurpose of the eidition, to celebrate the 80th Jubilee of Ordained Life of Luang Phu Tim during his 96th Year of Life, with the date of 16th June 2518 BE, which was the last edition to be released directly at Wat :aharn Rai before his Passing soon after in October 2018.Luang Phu did however perform some ceremonies and released amulets at other temples, such as Wat Bor Win during his last Year of Life. 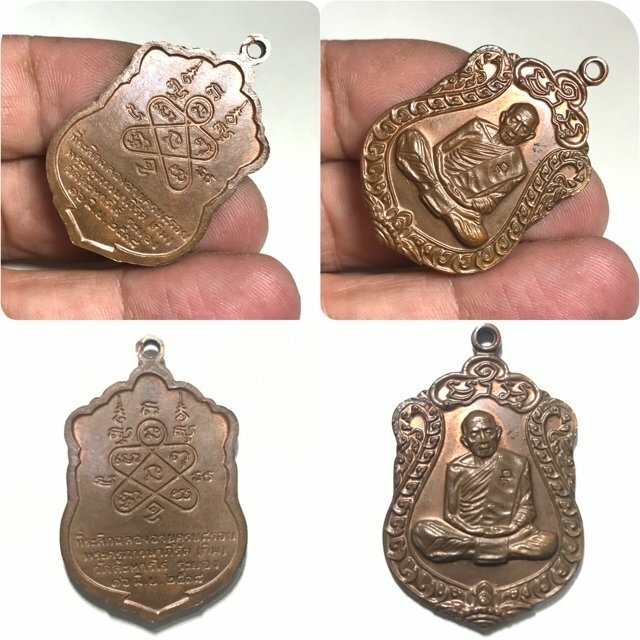 The Rian Sema Paed Rorb is one of the most well documented editions band is found included in almost all Amulet Publications of Luang Phu Tim, and is one of the main group of accepted Pra Niyom Class amulets which all groups and amulet societies accept and revere. 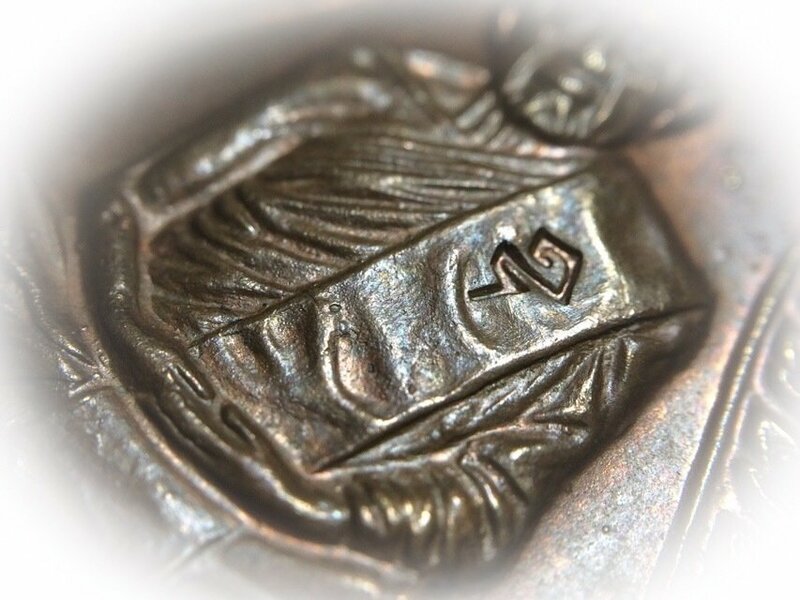 To add to this however, our proprietor Ajarn Spencer Littlewood has said we should add his statement, that "Apart from the officially documented amulets found in books, which are often puiblished by those who were involved with the creation of the amulets, and other publishers just document what they can, and leave out what they can't find enough pictures of to publish! 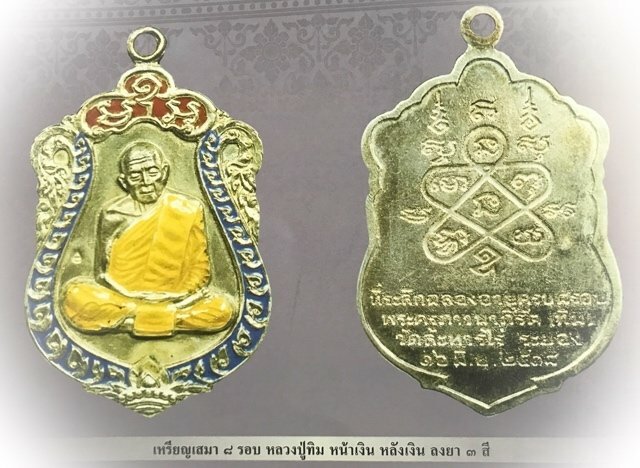 Hence, apart from the above mentioned officially documented coins released during the 80th Anniversary 'Paed Rorb' celebrations, Luang Phu Tim will have been distributing many other amulets such as Takrut, Pra Pong Powder amulets, Carved wood and ivory images such as Choo Chok, Singha, Roop Muean, Nang Kwak, Palad Khik, as well as Photos, Lockets, Pha Yant, Mitmor, Look Om, and so on". 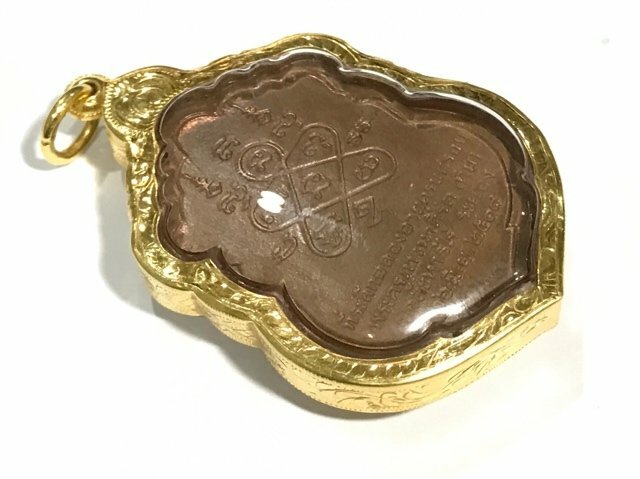 "The assumption that an amulet encyclopedia contails ALL models ever made by a particular Master, is a common mistake, most often made by those who are not in the know. 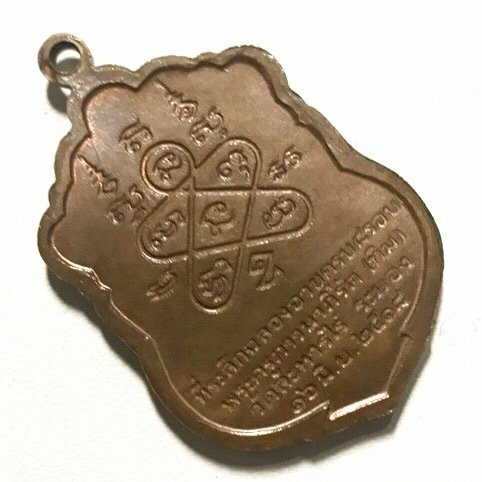 They have not thought yet that Firstly, most books and their authors, are limited by how many amulets they can find to photograph and document, compared to how many models they could not get a photo of. 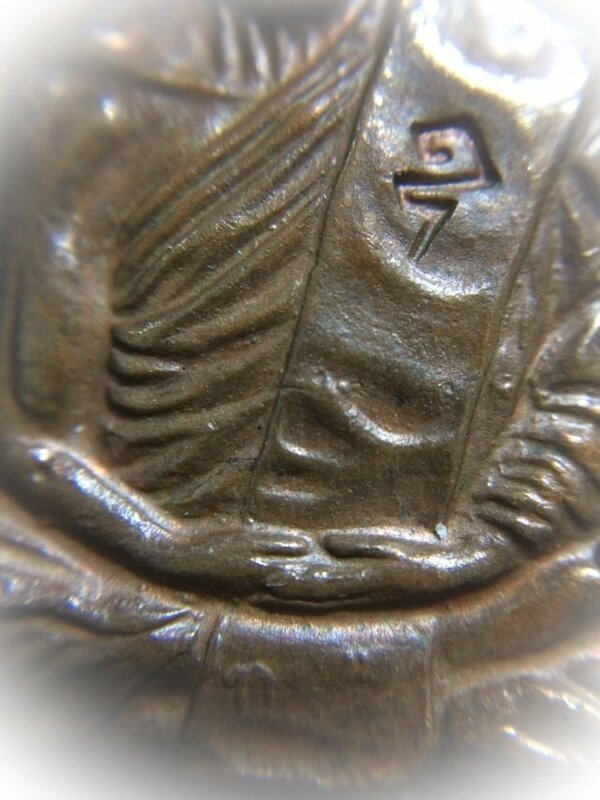 This then means that most encyclopaedic works contain known amulets of the Great Masters, but not all". 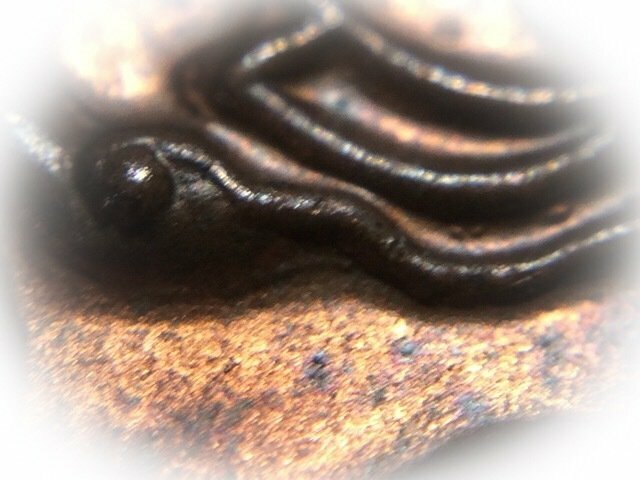 "Also, as the curators and publishers of the Pantheon Encyclopedias and the Amulet societies are constantly authenticating newly found evidence and adding newly accepted classics into the pantheons of the Masters, as and when they are discovered, and found to belong to which Master. 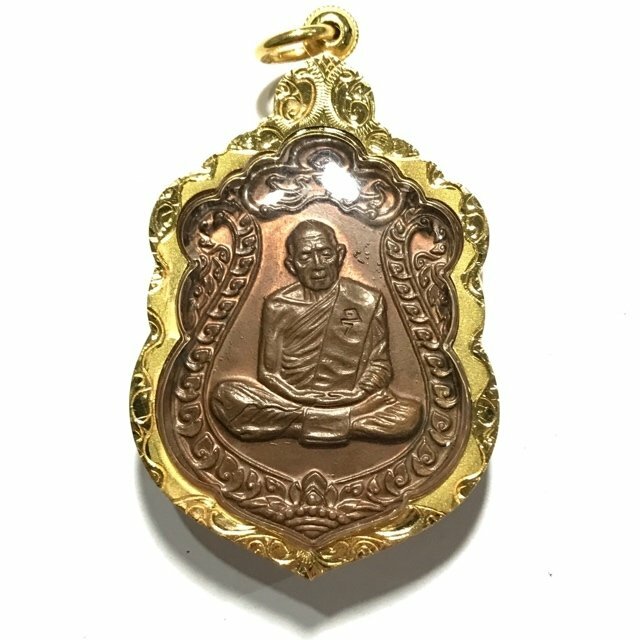 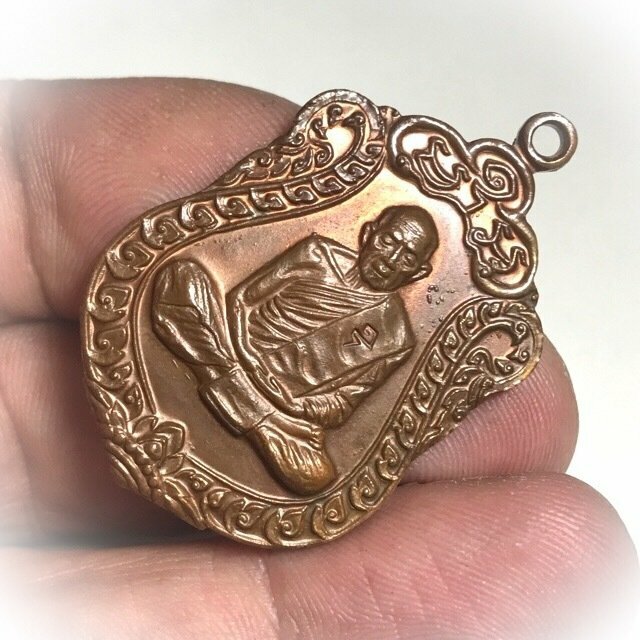 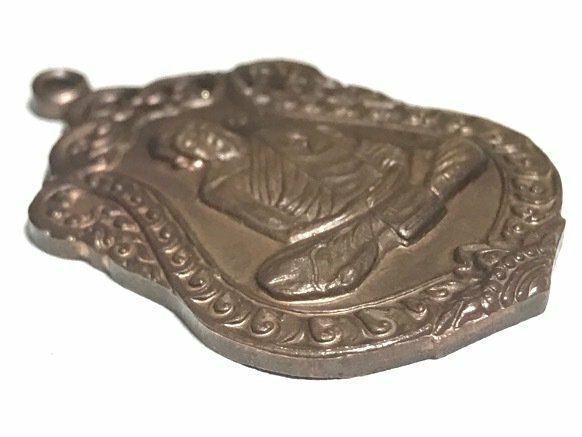 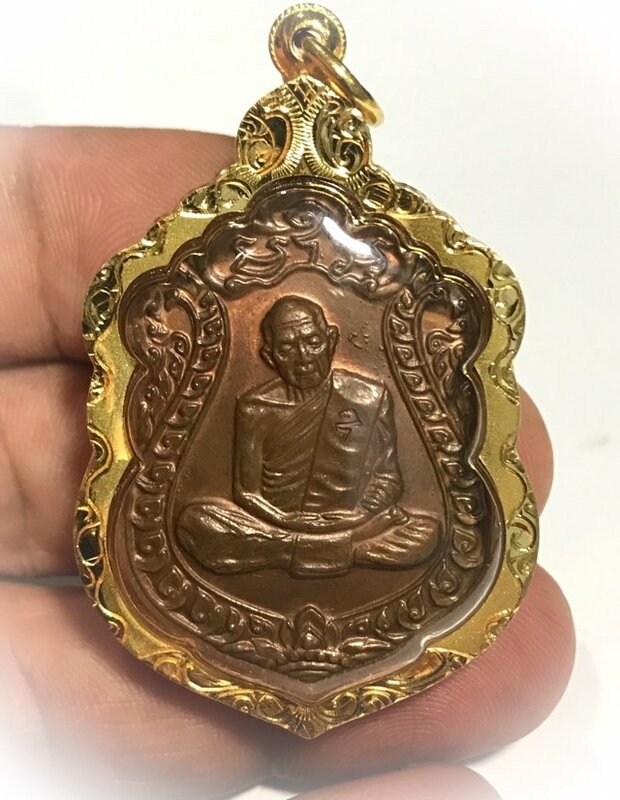 Hence, apart from the officially documented amulets released by Luang Phu Tim seen in Books, there are many amulets known by local devotees and true aficionados, which are not yet documented in famous publications. 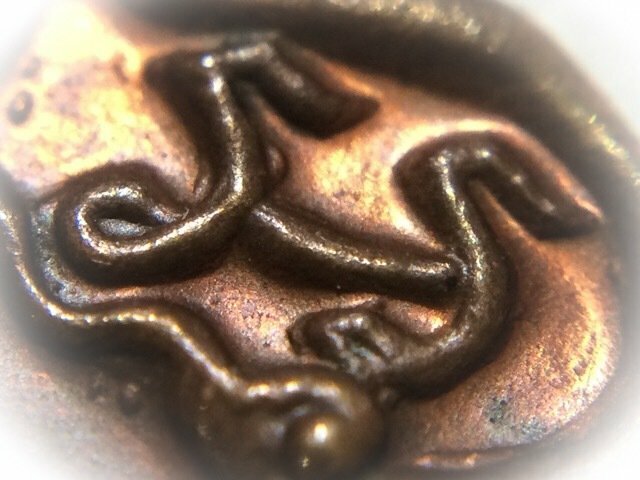 The beauty of this, is that the official pantheons grow as investigations uncover newly discovered editions from the Great Masters, which were to date undocumented and authenticated ". 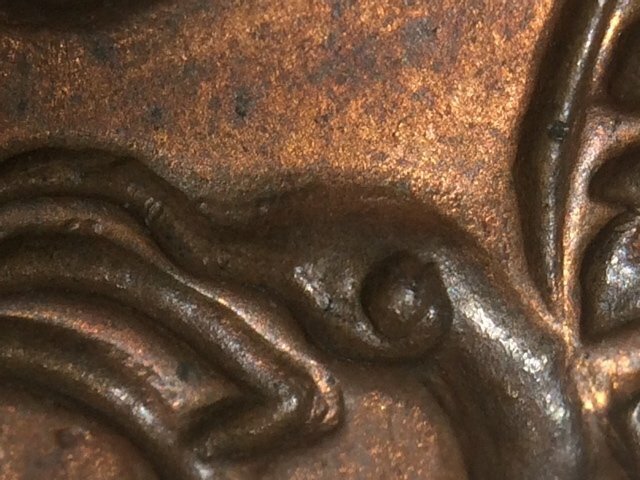 Below; LP Tim Amulets Book second revised edition (added newly confirmed discoveries), which shows how books are not the be and End All, rather, a mere base of Study as a starting point. 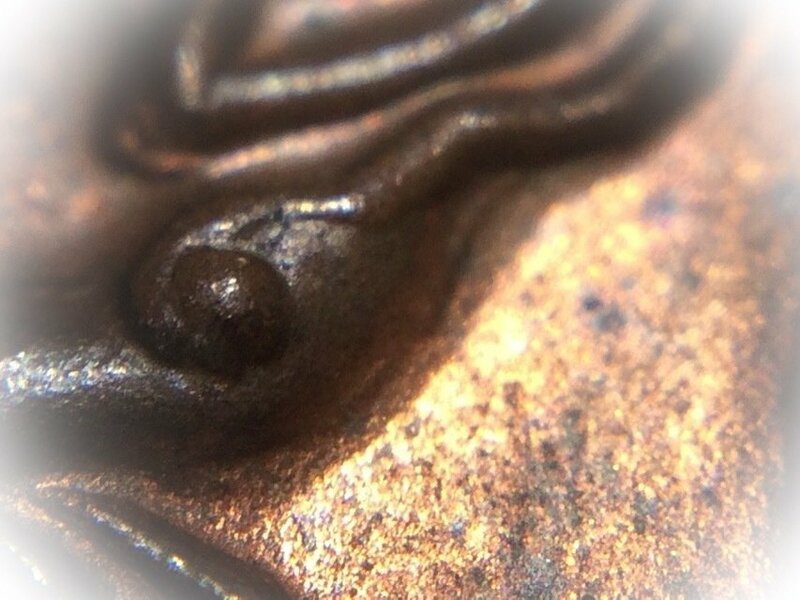 This does not detract from the importance of Books, because they are that which give the student their first basic principles of comparison, but books should also spur thought, curiosity and suspicion, and be contemplated when the mind discovers an Indiscrepancy in the information. 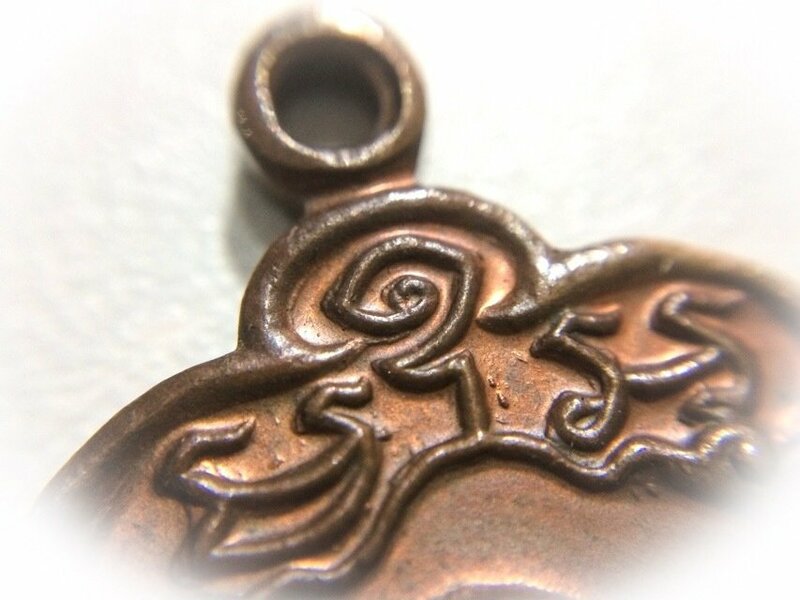 In the long run, an experienced student will be able to make valid and logical conclusions about the amulets they study, through contemplation of known facts, rumors, looking at the real thing under the eye loupe, and using every facet of amulet study in one's armory, to develop insight into what truly makes sense and is believable, or is corroborated. 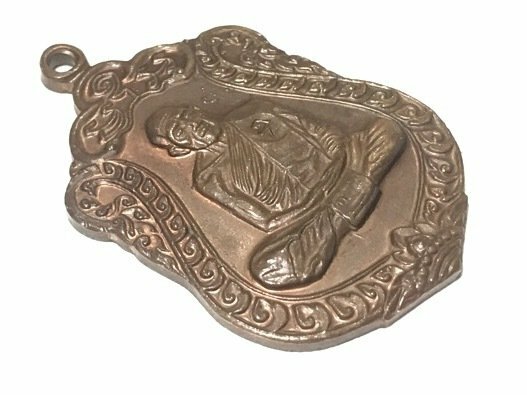 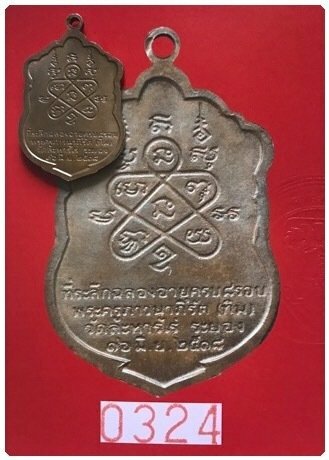 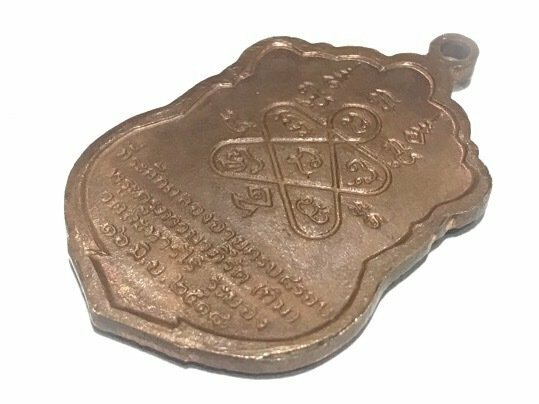 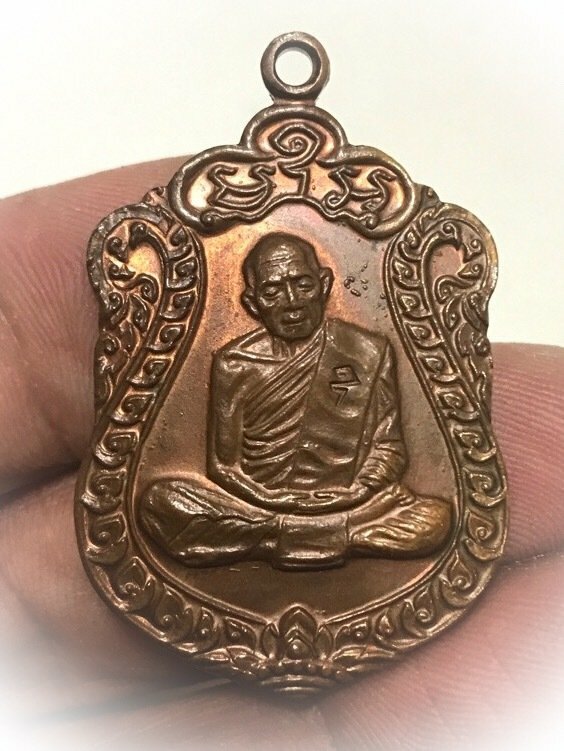 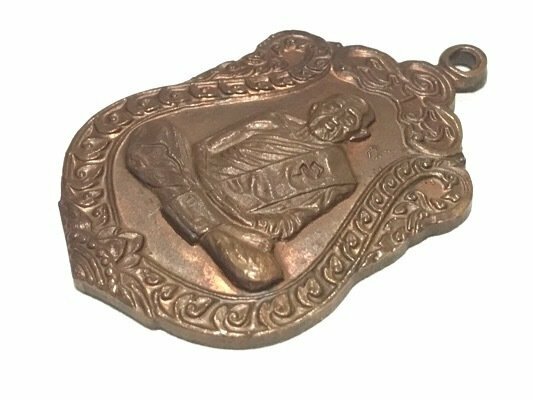 20 Years ago nobody apart from local devotees knew that Luang Phu Tim made amulets as early as 2497 BE, and only the 2517 BE edition was accepted. 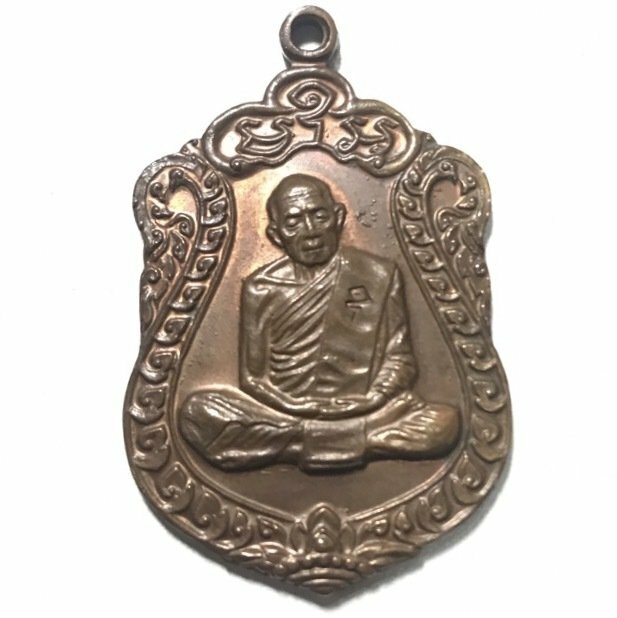 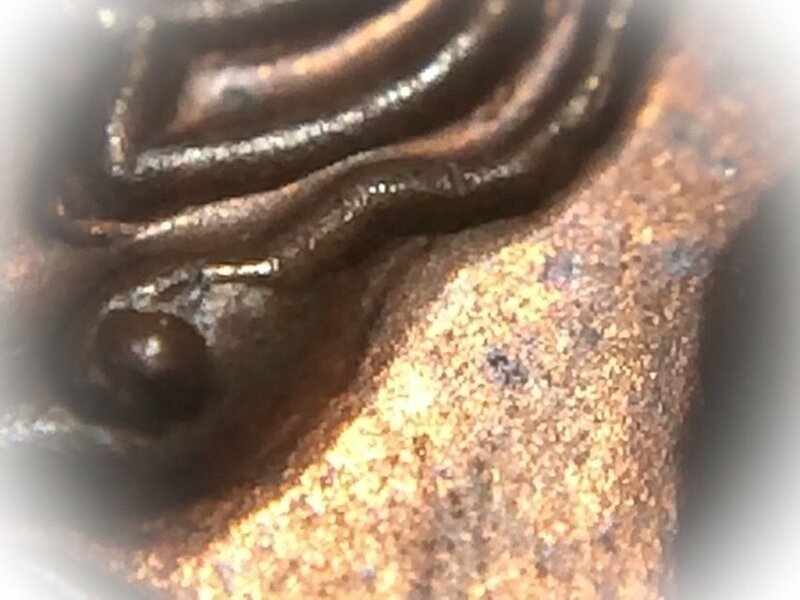 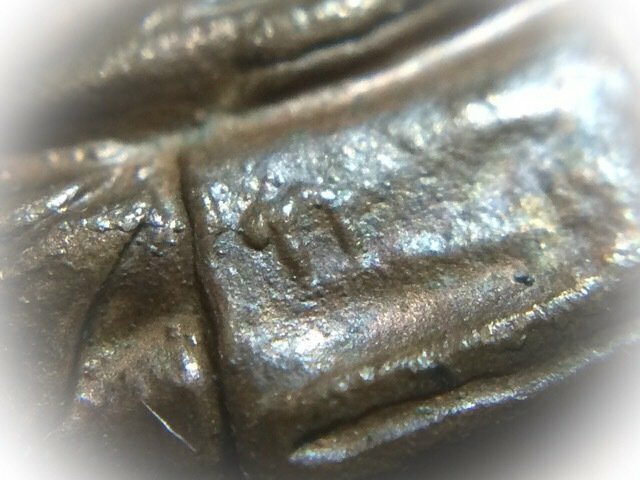 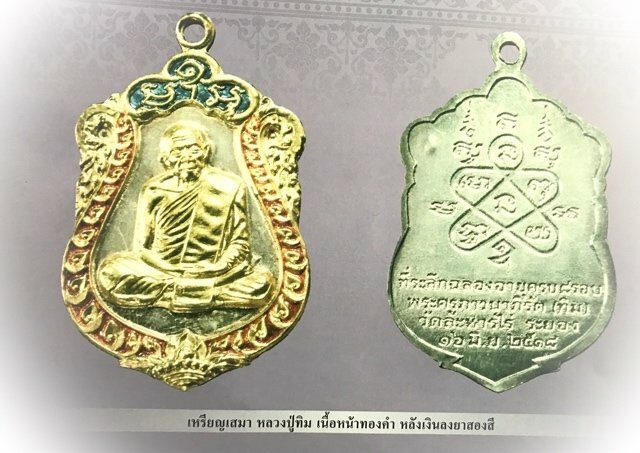 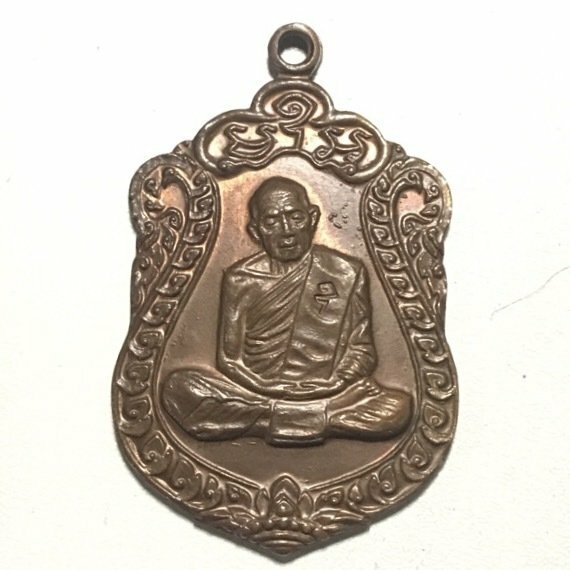 Now we have a much more comprehensive documentation and cataloguing of the Luang Phu Tim Amulet Pantheon, which has developed over the last two decades, and so his pantheon has grown, as the experts and competition Judges began to allow previously lesser known and rare early era amulets of the Master to be documented. 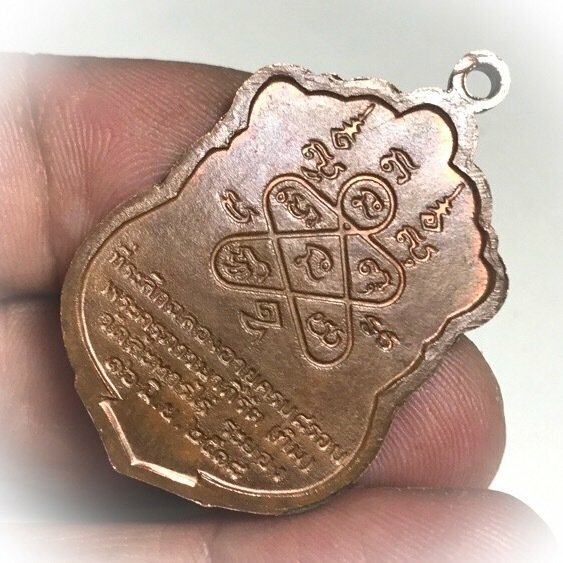 Amulet books are a good base starting point to begin one's journey into the immensely deep study of amulets, but should lead one towards the proper line of thinking, and one can never compare pictures in books, to examining the real amulet under an eye loupe with your own eyes, which is the true method for intensive study of authentic Pra Niyom Class amulets. 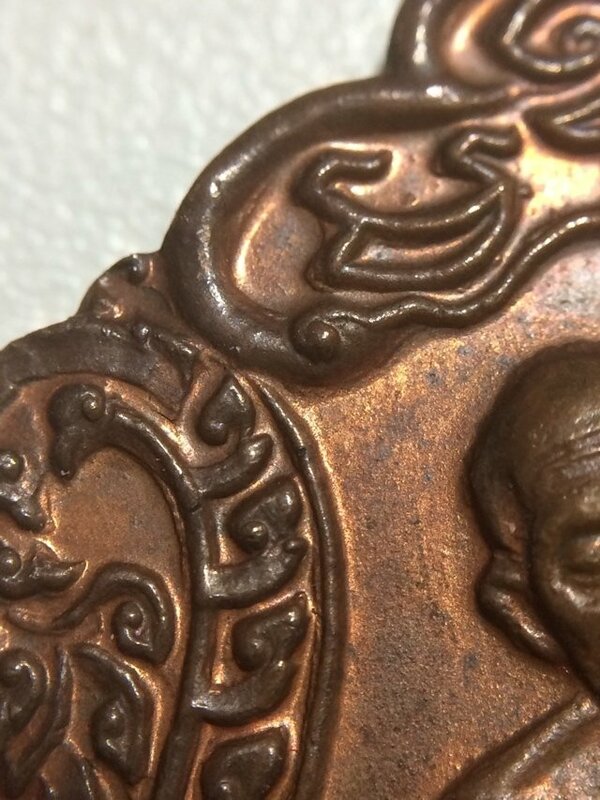 For the study of authentic amulets, one needs to apply varuious techniques, such as with Sacred Powder amulets, one should get to know the Sacred Clay and its ingredients, and the appearance of true ageing process, and with coins, one needs to focus more on the Pim (design features), aqnd have knowledge of how many Block press Molds were made, to define which Block press the coin was pressed or cast with, or if it is not from a known Block press (fake or yet to be confirmed. 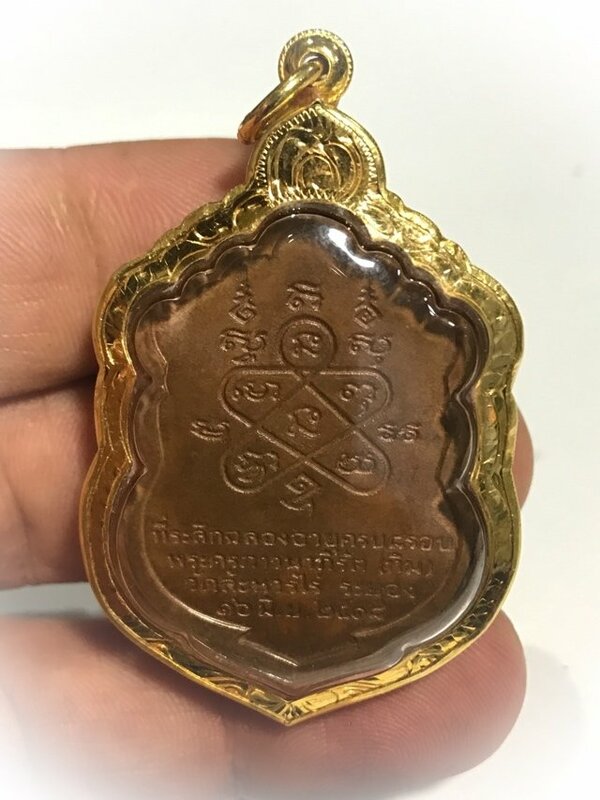 The Rian Sema Paed Rorb of the Great Luang Phu Tim of Wat Laharn Rai is one of the most famous amulets of all time, and highly renowned for its true power to bring prosperity and good business, power of attraction and mercy charm to the wearer, as is the case with all amulets of Luang Phu Tim, be it Pra Khun Phaen, Choo Chok, Rian, Roop Muean, Pha Yant, or any other amulet of this most powerful and humble Master of Immortal Legend from Yesteryear. 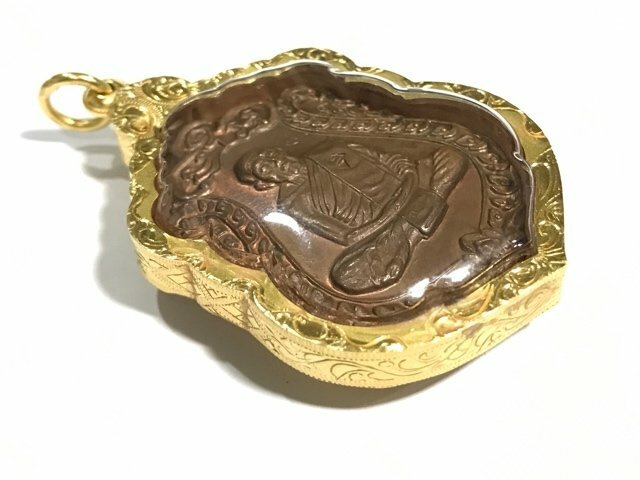 FREE EMS SHIPPING is also included in the price with this item. 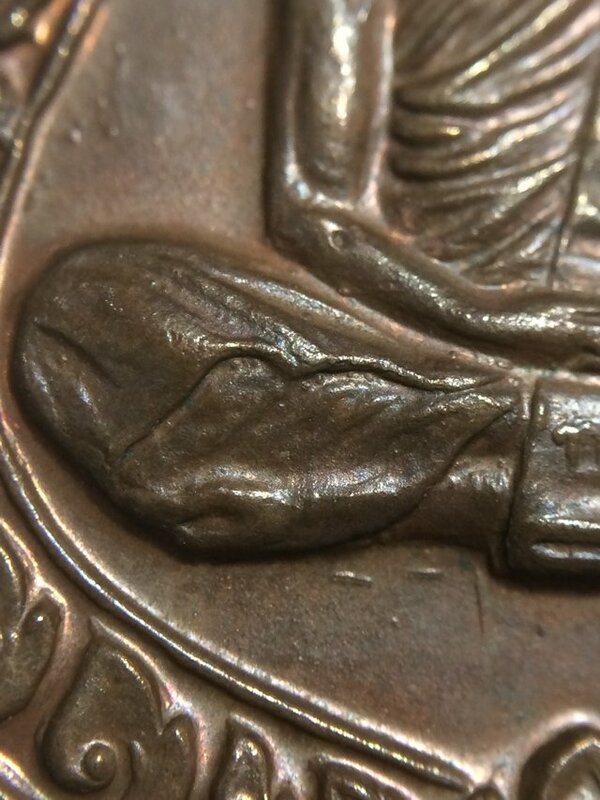 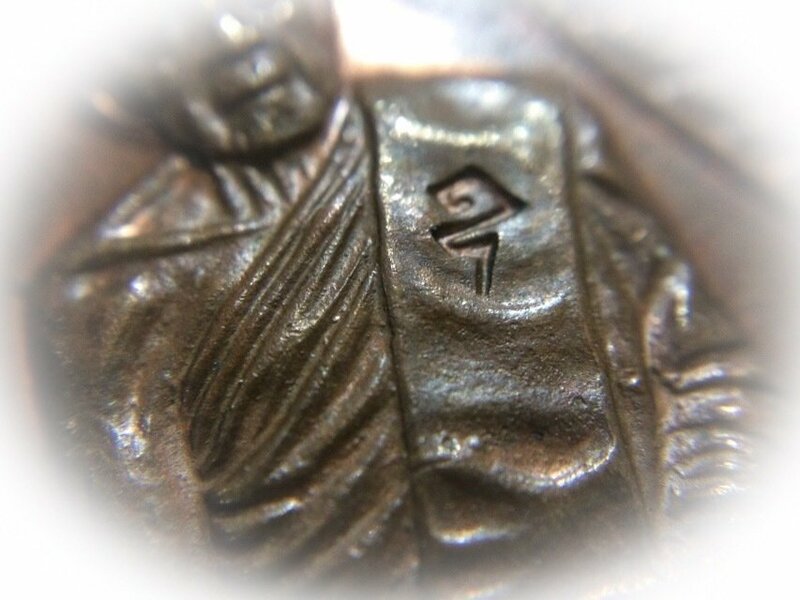 Below; The Secret Series Code stamp of Luang Phu, the Thai Letter ท (T for Tim) is stamped onto the fold in the Sangkati Sash which hangs over Luang Phu's legs below his hands. 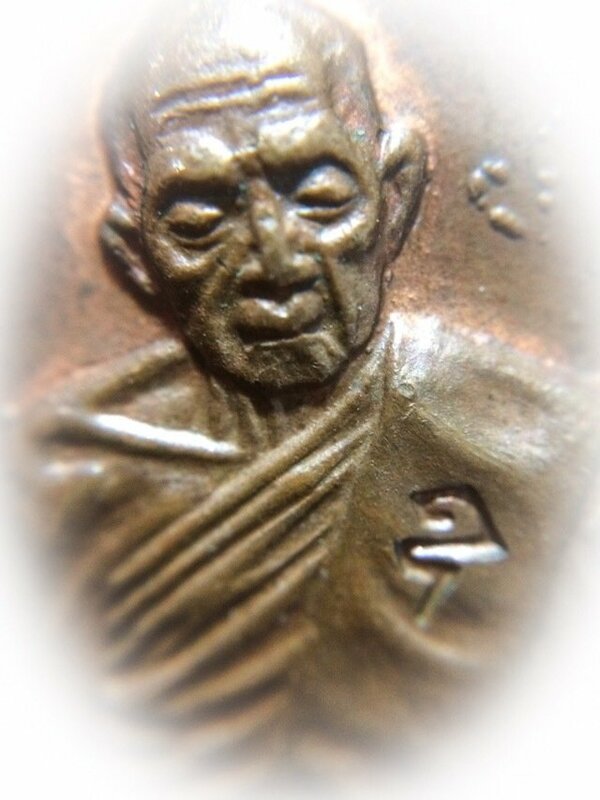 Below; Rian Sema Special Gammagarn version in Nuea Chinabanchorn with Ya Rachawadee See Khiaw Green Enamels, a perfect example of one of the variations of this coin not listed in the official listed Pantheon in most Publications. 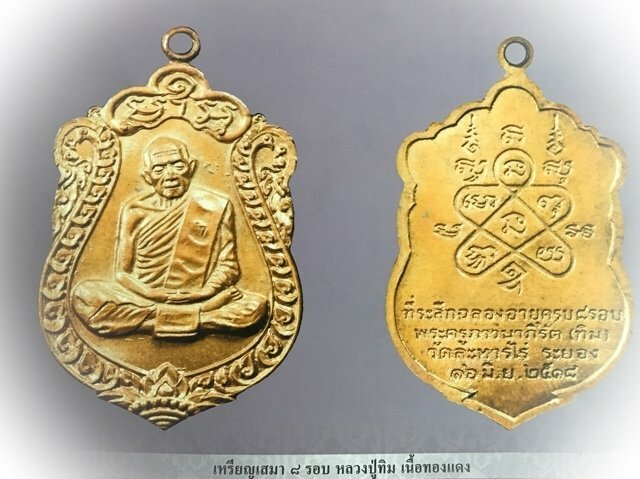 His Choo Chok Carved amulets and Pae Maha Lap Lucky Goats, and other animist Charms such as the Hanuman statuette and Sacred Powder Hanuman, various kinds of Takrut, Prakhan Sceptre Knives, Mitmor Knives, Pra Somdej in a variety of forms, Pra Pid Ta in many forms, Pra nakprok Bai Makham Miniature Naga Buddhas,, Pra Sivali, Bucha Statues, Blessed Photos, Pha Yant, Palad Khik and Luang Phu's Pong Roop Muean Sacred Powder Monk Image in Loi Ongk statuette form. 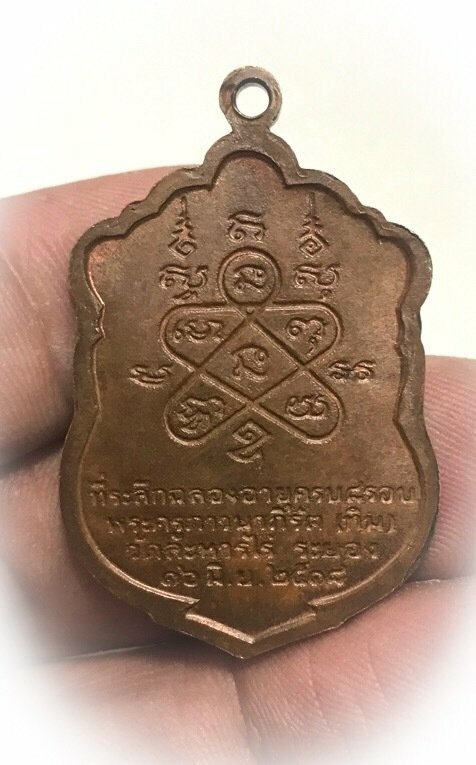 Below; an example of the Rian Sema Paed Rorb in Nuea Tong Daeng Long Ya Rachawadee, of which only 50 were made in all, making this version an extremely rare (and highly expensive) amulet. 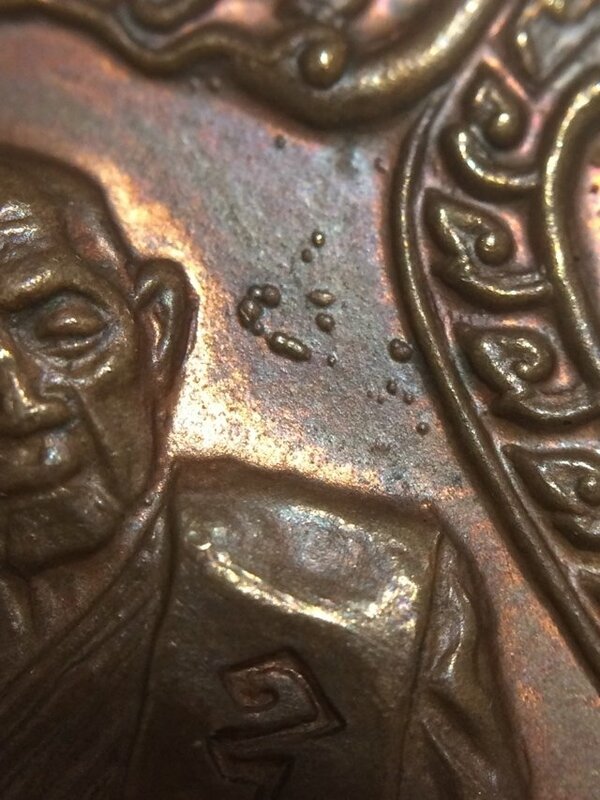 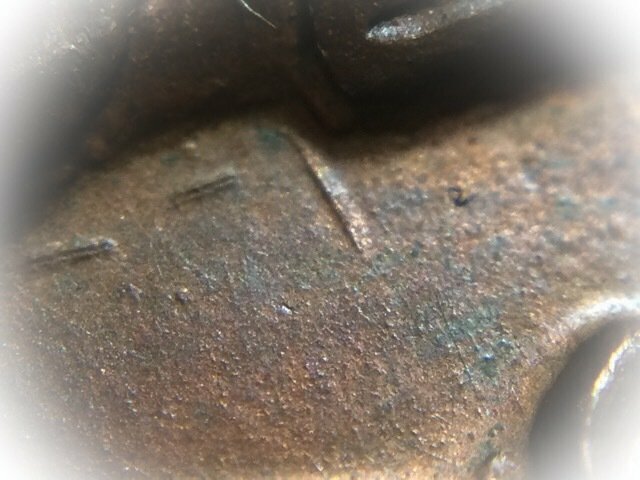 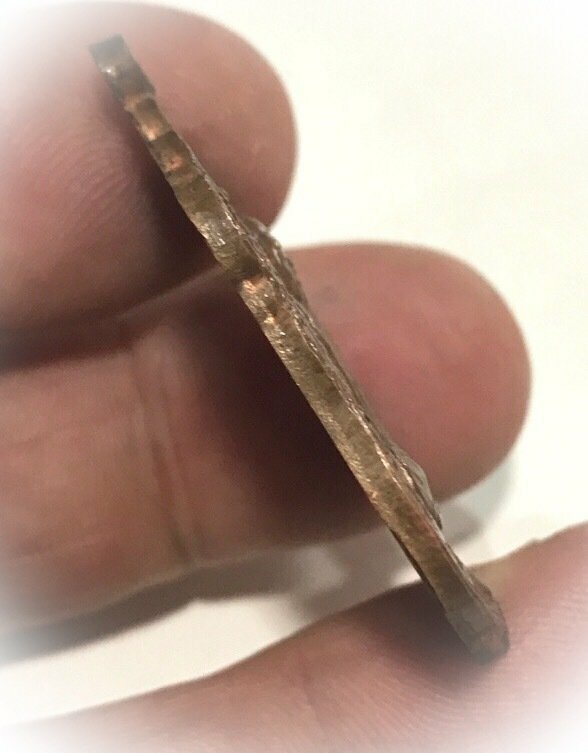 Below; Roi Tabai file marks on the edge of the coin where the Artisans have filed off the surplus metal after pressing the coins in the Block Press. 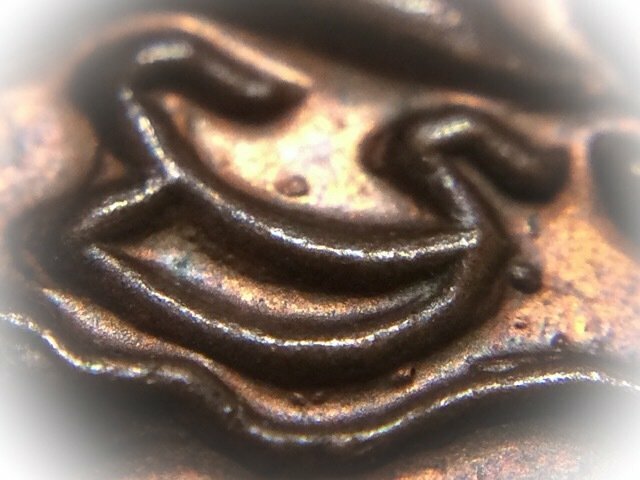 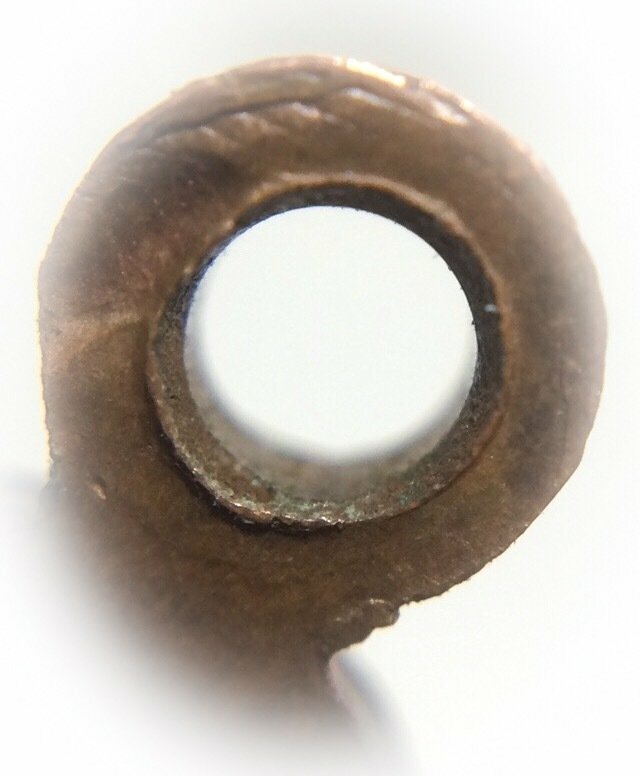 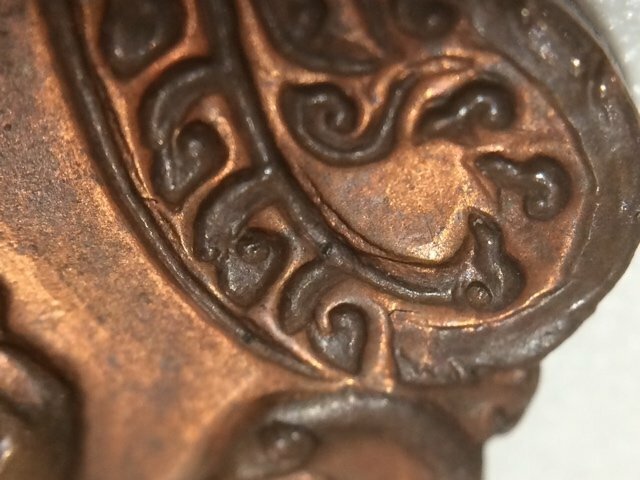 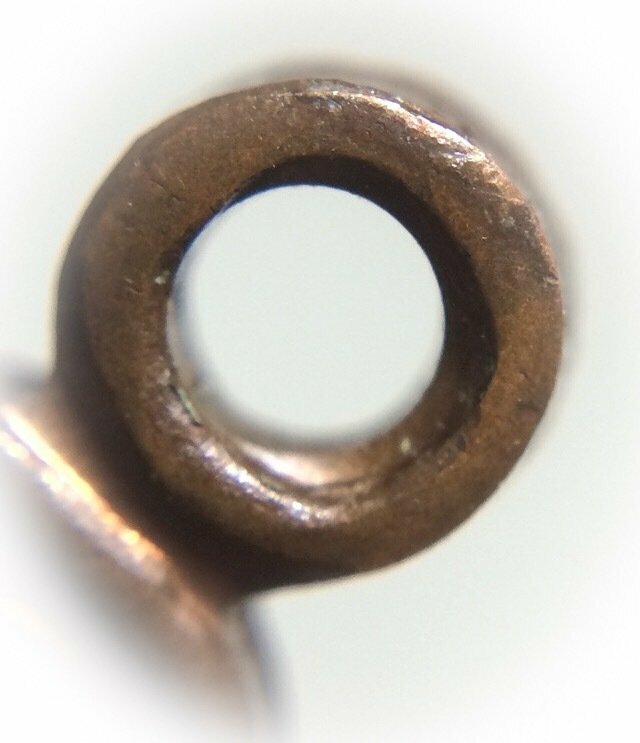 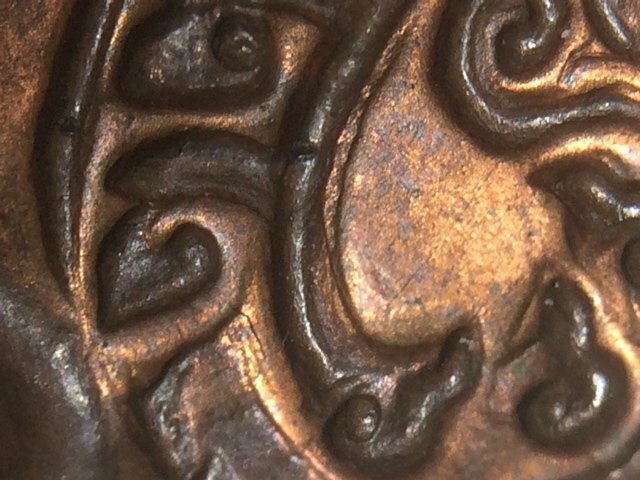 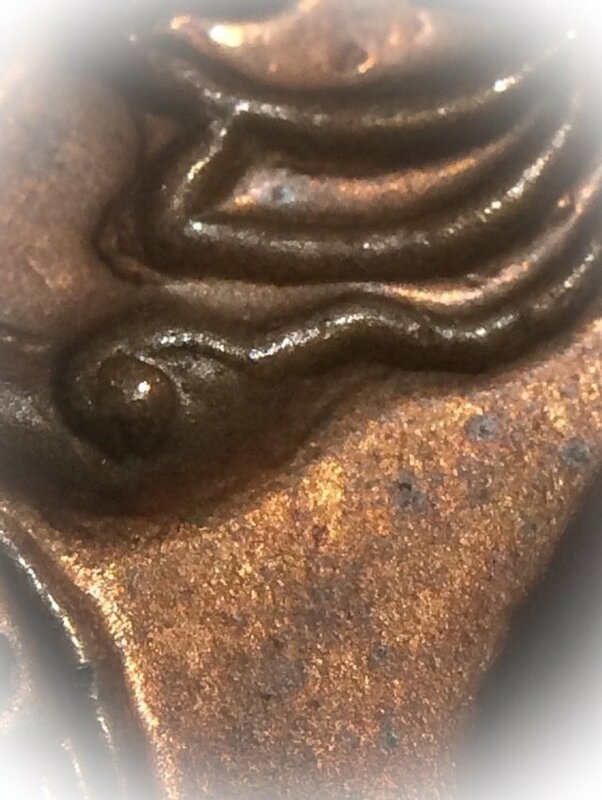 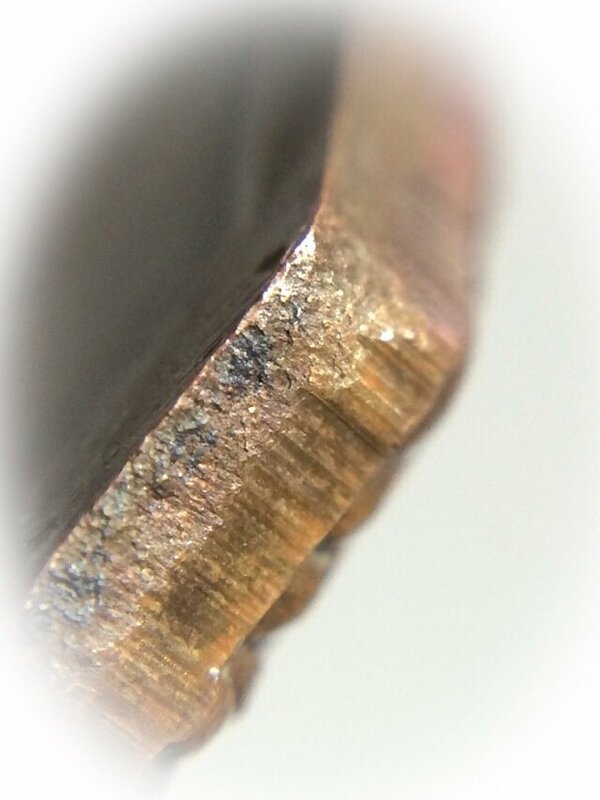 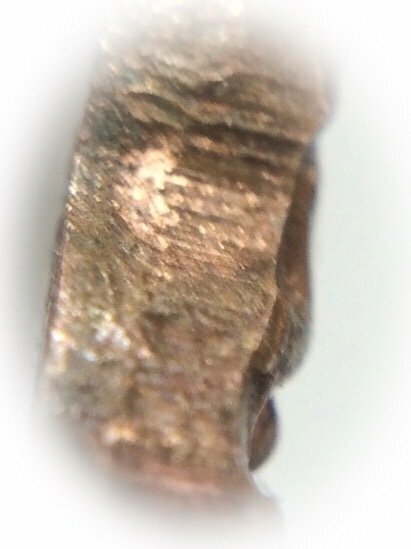 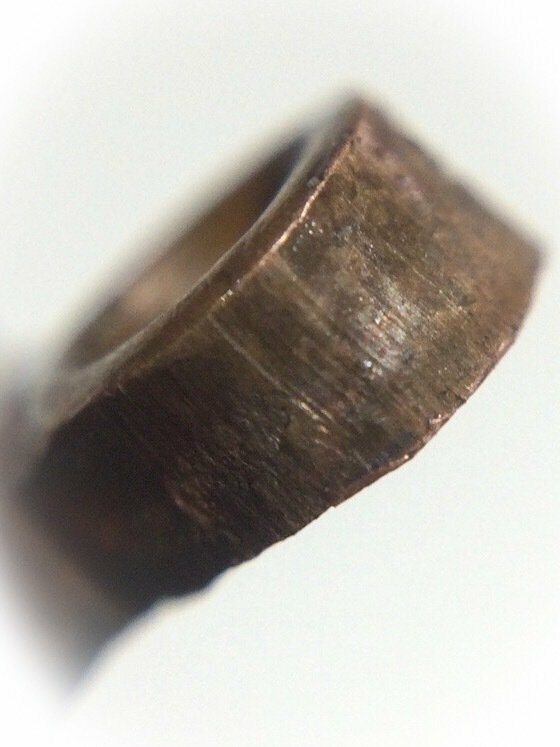 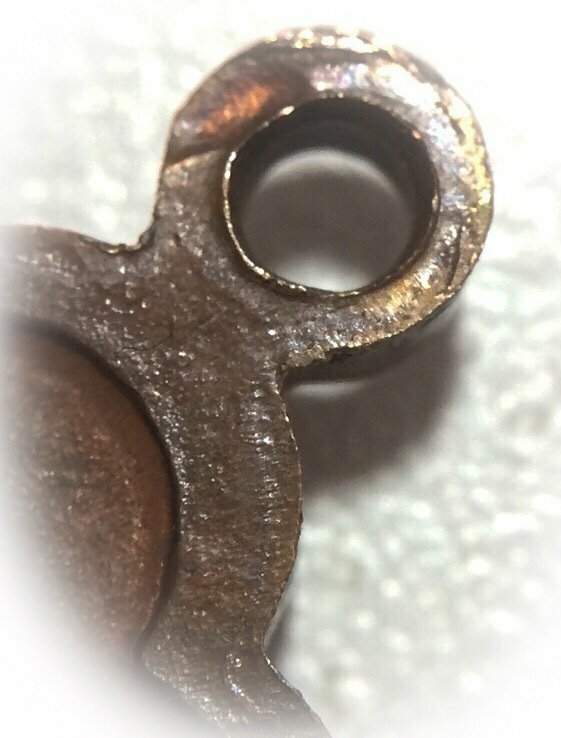 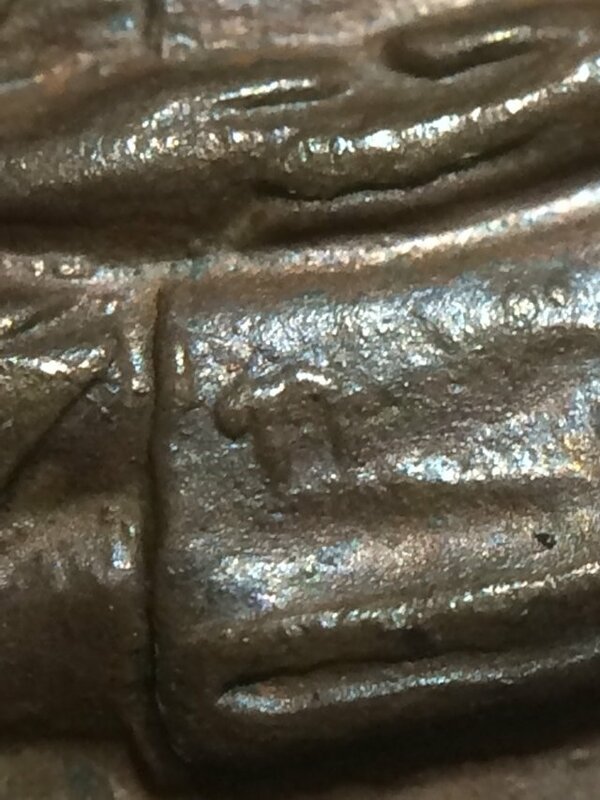 The pattern of the particular file used to file down the edges is also part of what a student should peruse and compare to distinguish the block press, or the authenticity of the amulet. 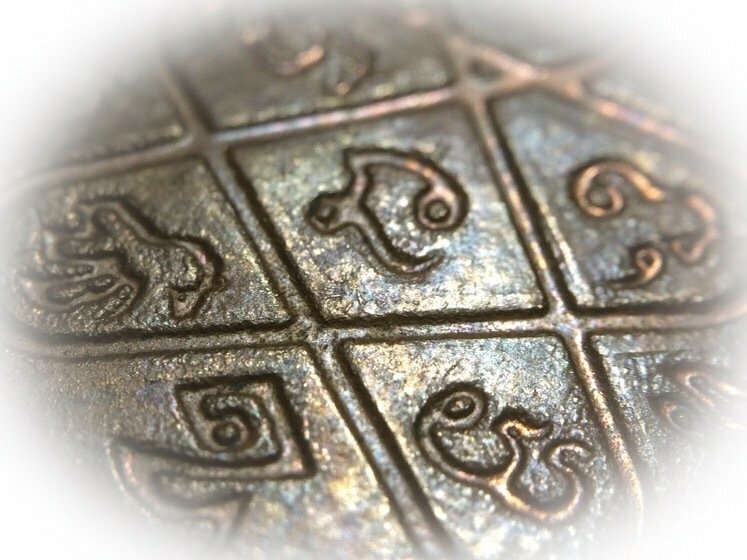 Other lesser known Sacred powder and carved amulets of LP Tim include Ruesi (lersi), Suea (tigers), made from Walrus Tusk and Bone, Wood or Ivory, or Tooth, and Ling Gae carved Vanora Monkeys. 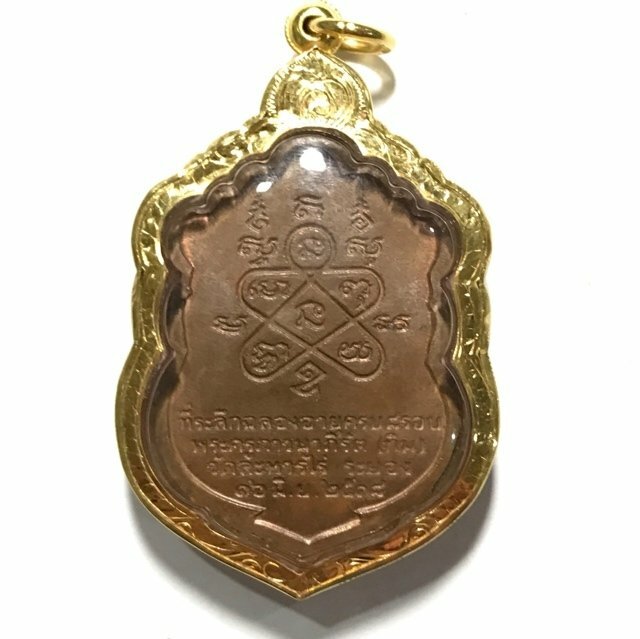 The Pra Kring Chinabanchorn amulet of Luang Phu Tim is one of his most expensive of all amulets, and extremely rare to find. 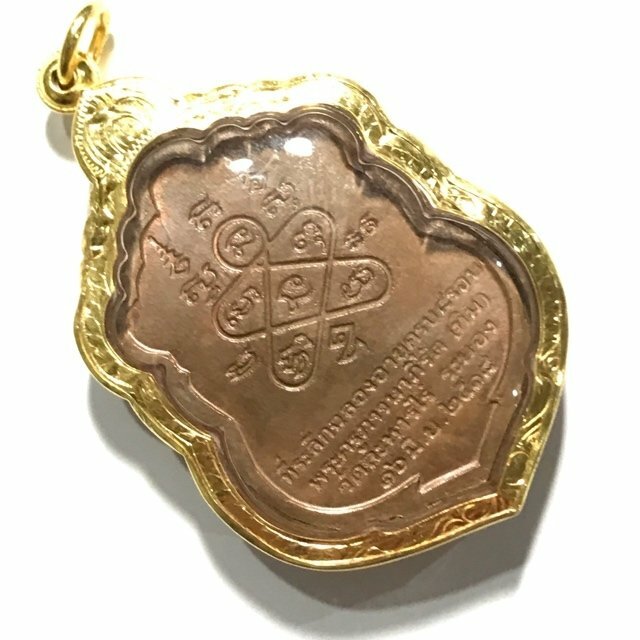 He has various direct lineage apprentices, Who are continuing to progress and spread his most powerful and world-famous Wicha. 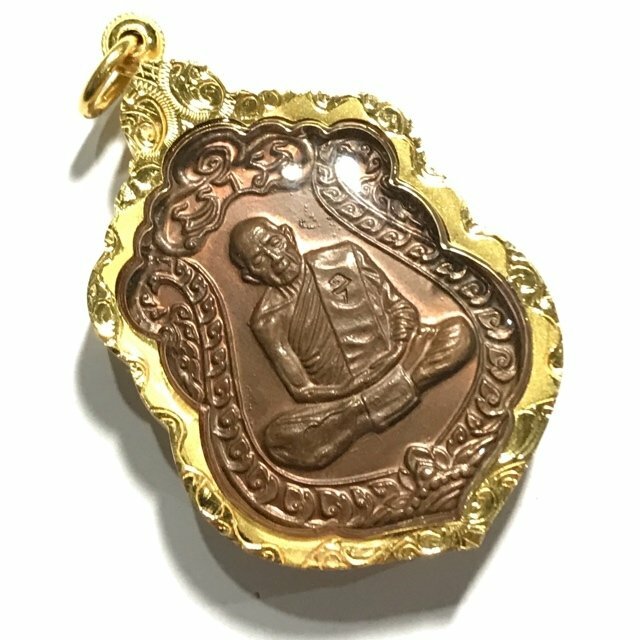 Of all of these masters, perhaps the most famous, preferred, is Luang Por Sakorn, of Wat Nong Grub (also now deceased). 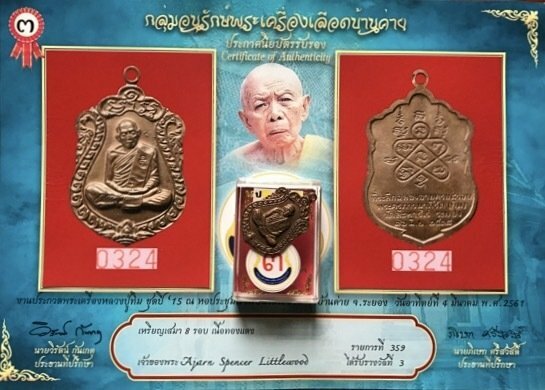 In second place one could estimate the great Luang Phu Sin, of Wat Laharn Yai, and in third place, possibly, Pra Ajarn Somkid, of Wat Beung Tata (Rayong). 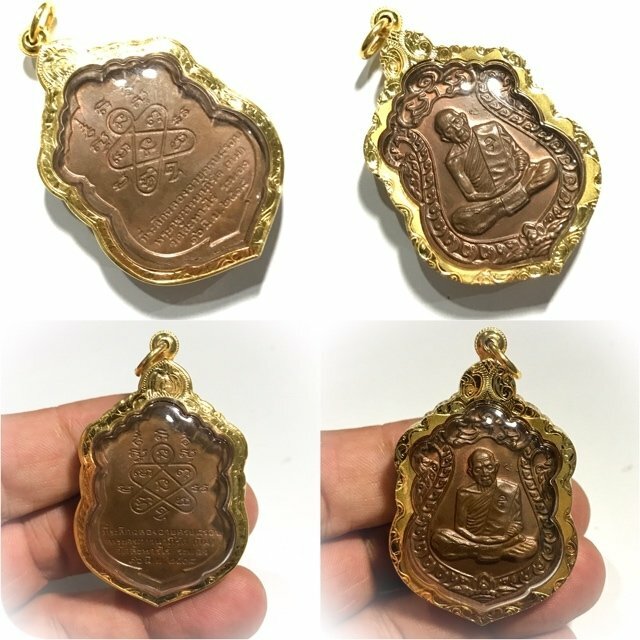 Also, recently, intense interest has arisen in the amulets of Luang Por Rat, who is also rising in status as a Lineage Master of Luang Phu Tim, who has gaiined a large following in the North, with his Charitable Deeds and Powerful Amulets.The amulets of Luang Phu Tim remain amongst the top three most popular Masters to this day, and his legend will cnotinue as time passes, as his place has long since been assured to stand in the podium of the Greatest Masters in the History of Thai Buddhist Amulets. 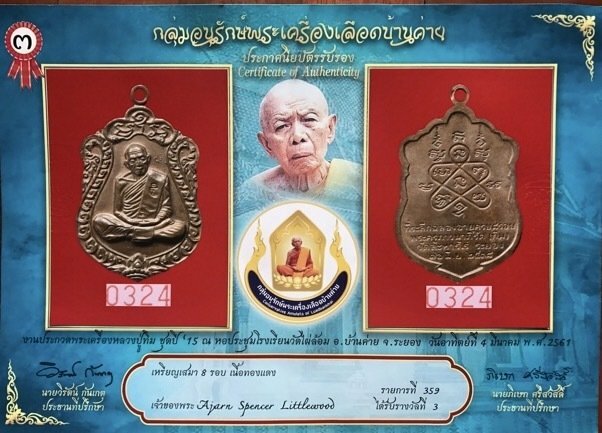 Below; A4 size 3rd Prize Competition Winner Certificate of Authenticity from the 2018 LP Tim Amulet Association Meeting at Wat Pai Lom Temple in Rayong, which was entered into competition for us by Ajarn Spencer Littlewood, and which which we will plastify and send to you with the amulet.